We’ve had plenty of rain and strong winds since our last outing a week ago, but today we had the chance of a mainly dry day with some sunshine, although the forecasted strong north westerly winds would be keeping the temperature down and make for arduous walking on the higher fells. 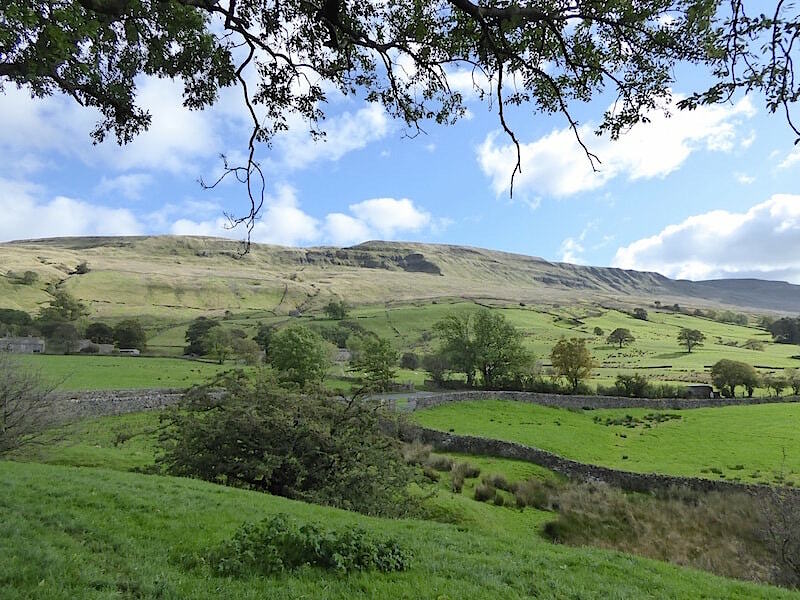 No fell walking today then, instead we chose to walk along the lovely Mallerstang valley and take a look at a couple of its ancient castles along the way. 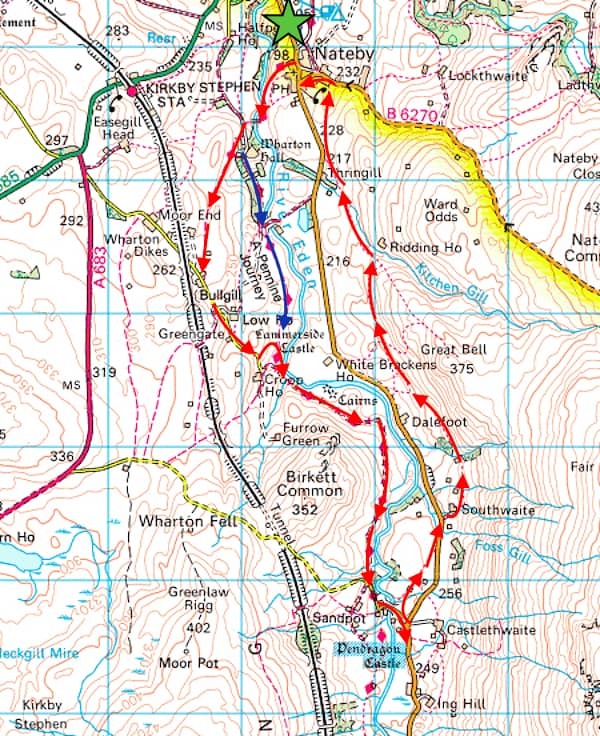 Red shows the actual route, blue shows the intended route. More about that later. We parked by the bus shelter at the northern end of the village of Nateby. There is parking for another car on the far side of the shelter with room for a few more cars around the village green just a little further up the road. It rained all day yesterday and overnight and its a cloudy and windy morning. Things are looking a little on the grey side but the clouds are scudding along rapidly so perhaps we will get more sunshine as the day progresses. Note the little bit of whimsy in the recess at the top of the shelter wall, it made us laugh anyway. 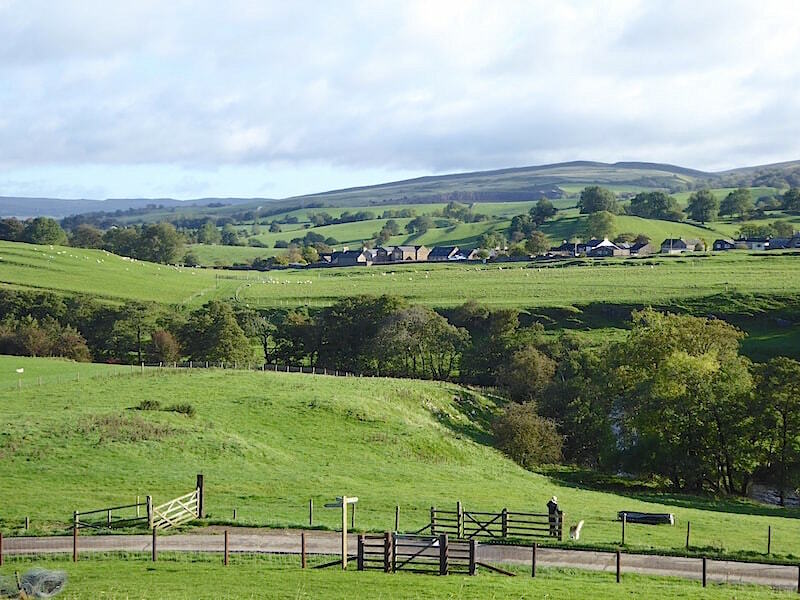 Our route today starts opposite the bus shelter and tracks to the left, behind the houses, over the grassy fields. The overnight rain will have left the grass very wet so the waterproof gaiters go on, our packs are hoisted and off we go. Out onto the open fields behind the houses now as we begin making our way across to Wharton Hall Farm. Although the grass was still very wet the ground was firm enough, with none of the slow and soggy floundering which has been the norm lately. 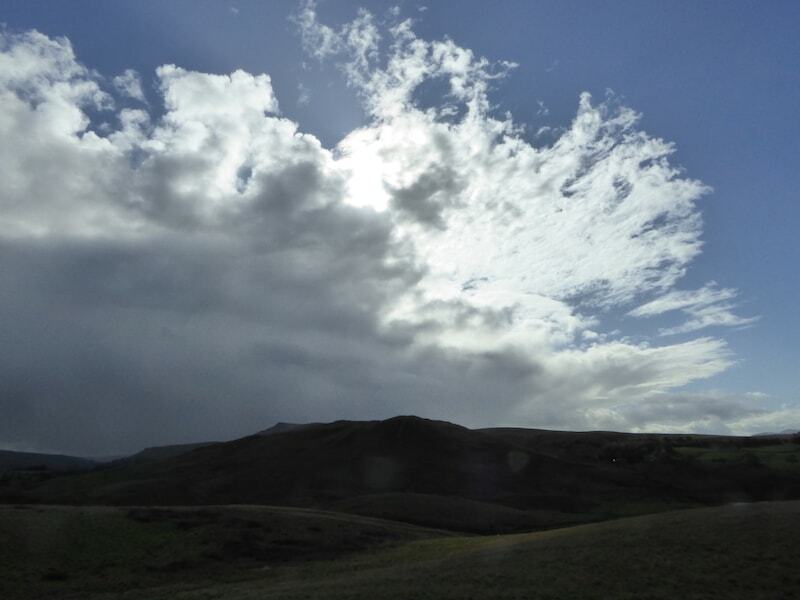 The wind was pushing the clouds, and us, along at a very brisk rate as we crossed the fields and larger patches of blue sky began putting in an appearance. 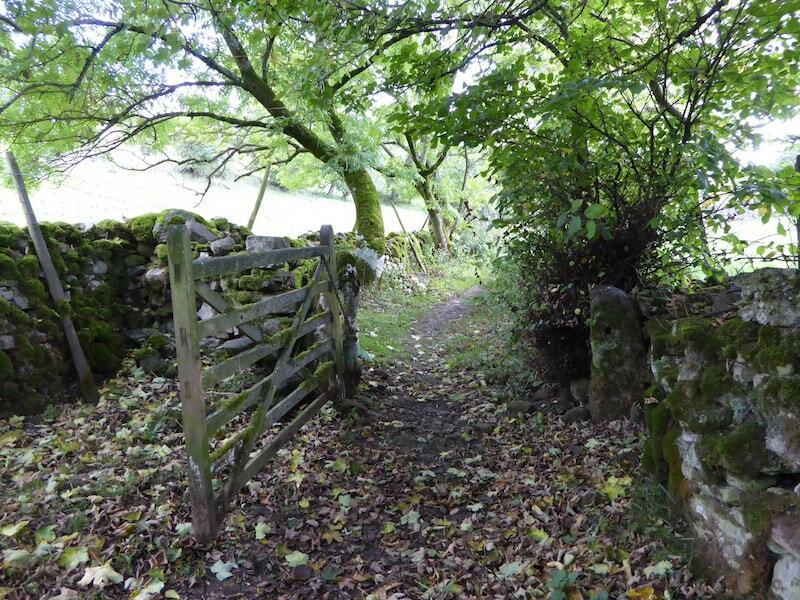 Once through the gate …..
….. its downhill to the next one where the path follows the curve of the river bank to the bridge crossing the River Eden. Through the second gate and following the curve of the river which is out of shot over on the right. This field was rather soggier than the previous ones but it does have cattle in it and their hooves had churned it up quite a lot. However the route through it was very short and we were soon at the bridge so we didn’t have to put up it with for very long. 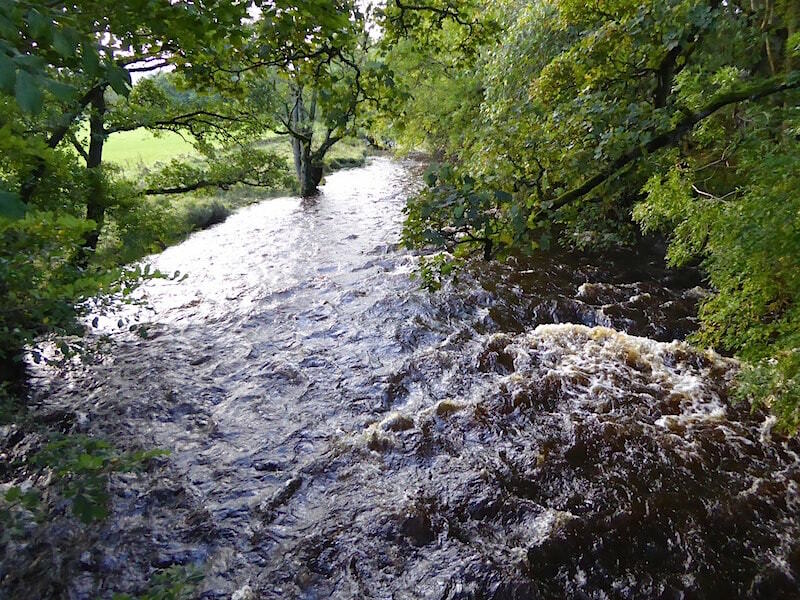 Back on drier ground as we cross over the bridge …..
….. and peer down at the peaty brown water of the River Eden which was very full and running at some speed today. A look back at Nateby village as we climb the hill beyond the bridge. 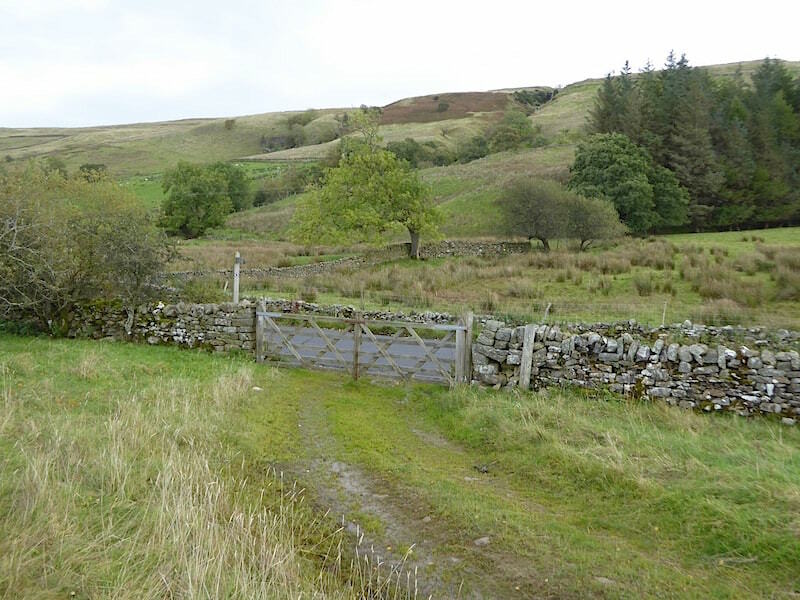 A man and his dog begin making their way down to the bridge having approached the gate from the farm track over to the left. 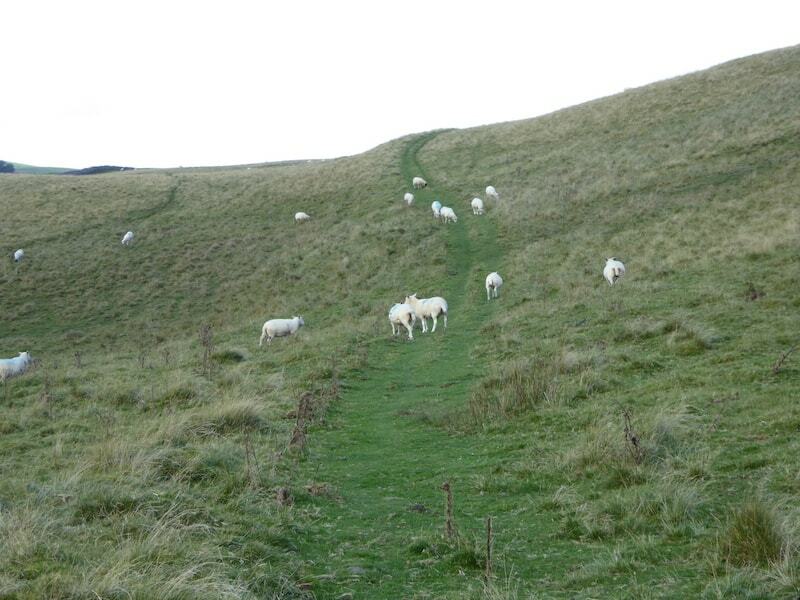 The track leads on towards Wharton Hall Farm to the right but the path leads on up this hill to bypass the farm. 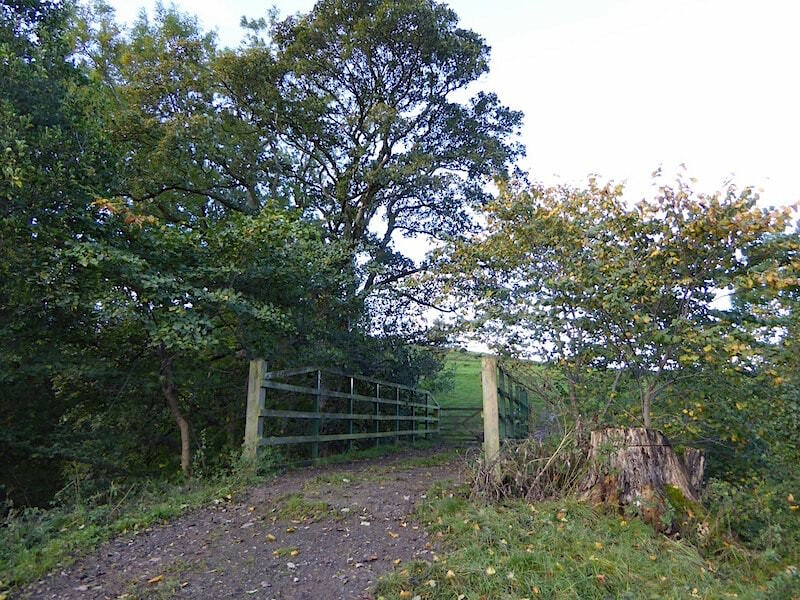 A notice beside the gate asked horse riders to use the farm track instead of climbing this hill. 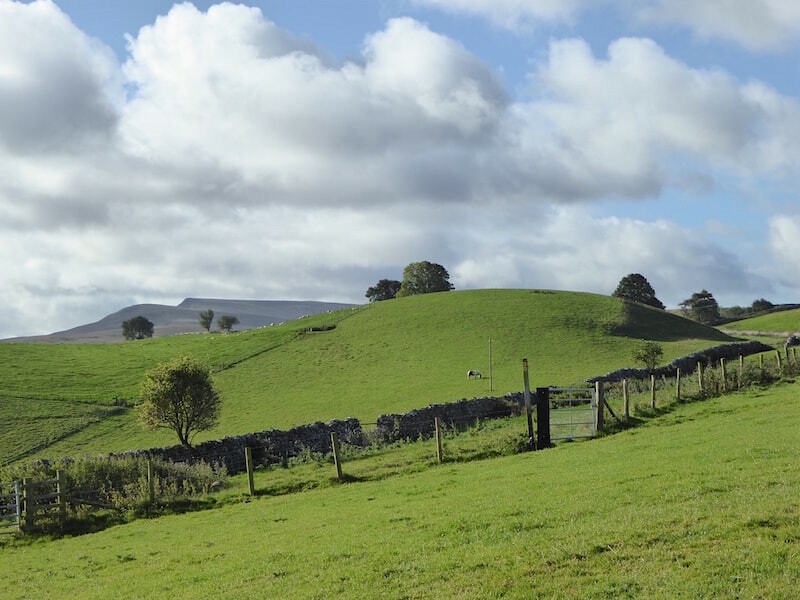 We head for the gate at the end of the track above the farm with a view over to Wild Boar Fell over on the left skyline. The clouds are breaking up and we’re getting longer sunny spells but blimey, it ain’t arf windy up here. What it will be like on higher tops we know only too well. The lane by the gate leads down to Wharton Hall. 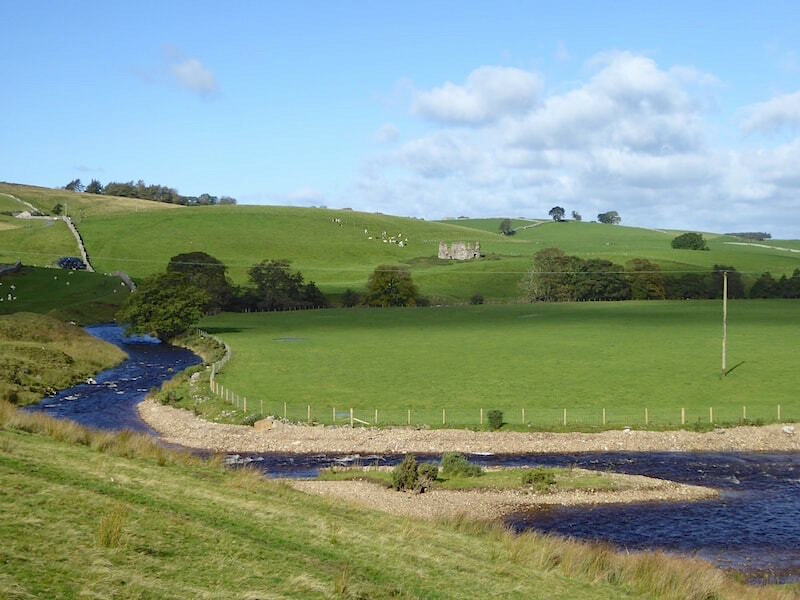 Below us is Wharton Hall, a fortified medieaval manor house overlooking the River Eden. The tower house was built by Sir Thomas Wharton in about 1436. The tower was besieged in 1536 during an uprising against Henry VIII’s break with the Roman Catholic Church and the dissolution of the monasteries. 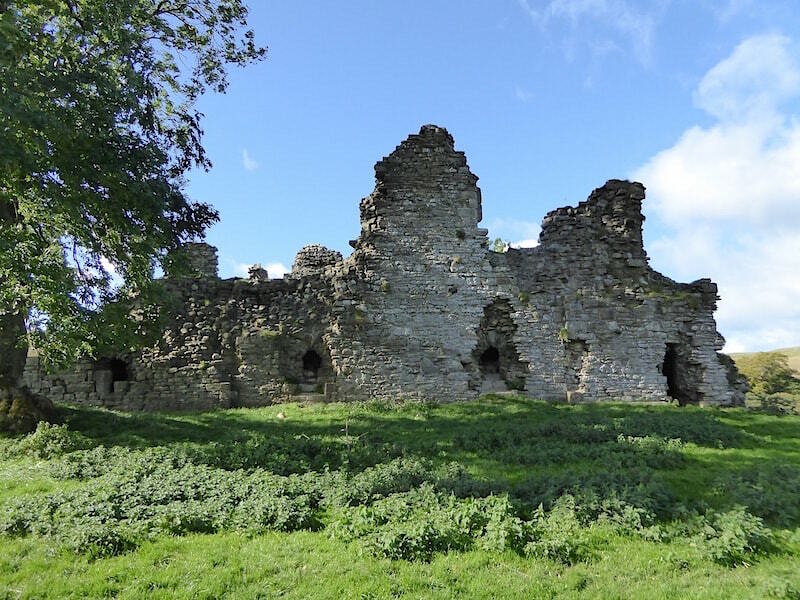 Following this the manor was extended and fortified, with a gatehouse, great hall, kitchen and surrounding curtain walls being built. However, the Wharton family seemed to have preferred to live in one of their other great houses and the hall eventually fell into ruin. During the 18th century it was restored by Lord Lonsdale, and the house itself was restored yet again in the 20th century. The photo shows the roofless but still very imposing gatehouse with the restored house to the left of it. 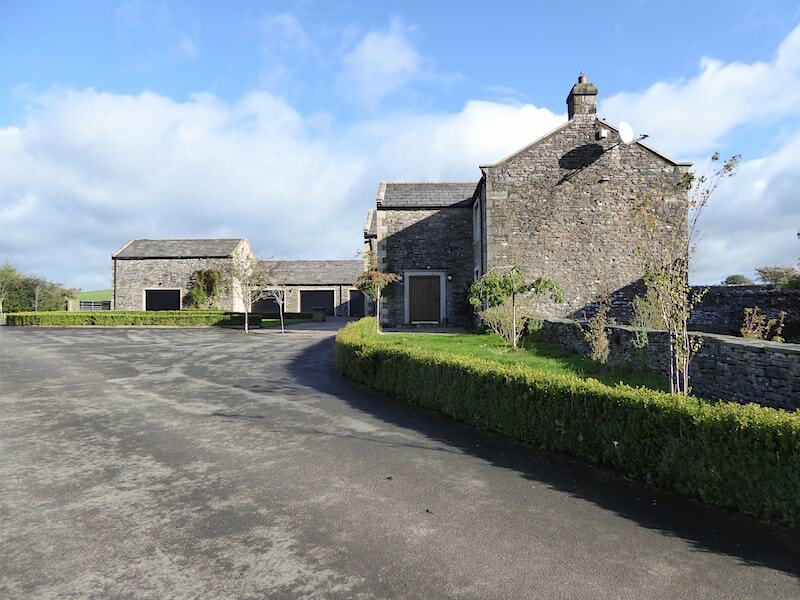 Wharton Hall, which is privately owned and not open to the public, is now a scheduled monument and a Grade I listed building, in addition to being part of a working farm. 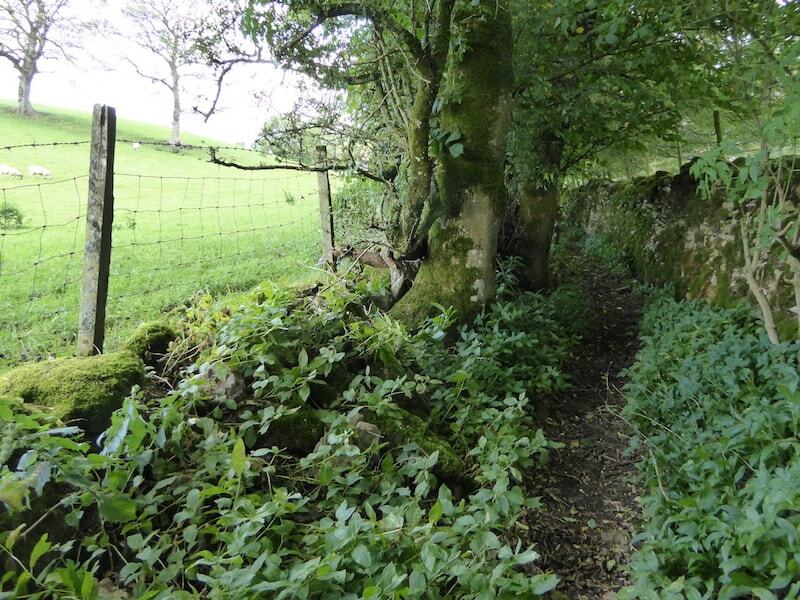 At this point what we should have done was to follow the lane down to the Hall and follow the bridleway along the banks of the River Eden. 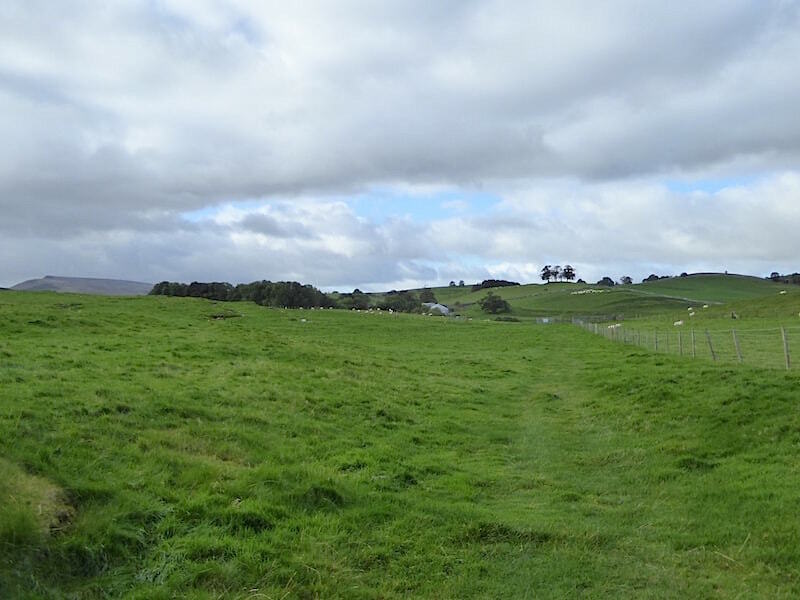 The route is clearly marked on the map but for some reason we continued on across the fields over to Bullgill. I rather suspect we were too busy talking about the Hall to pay enough attention to where we should be pointing ourselves. 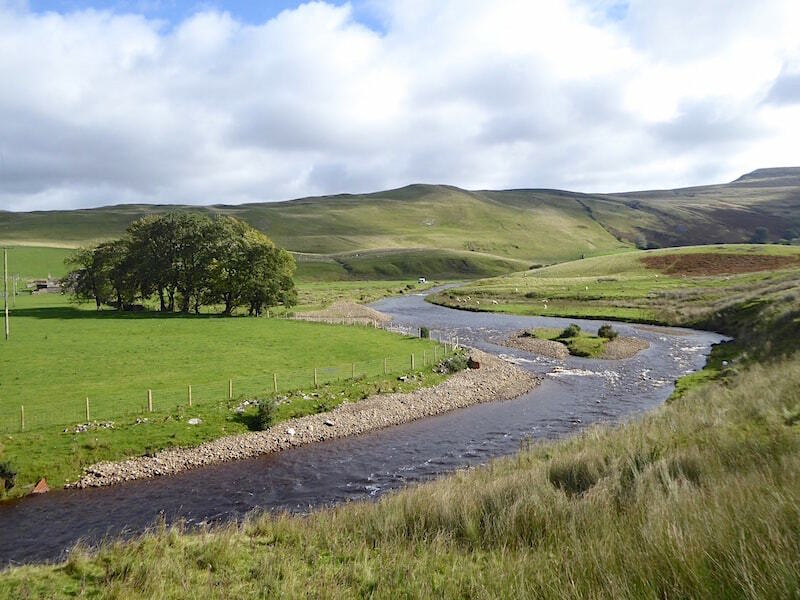 It didn’t matter in the slightest, other than it might have been rather more interesting to walk beside the river than across a couple more fields, because in the end we finished up where we wanted to be. 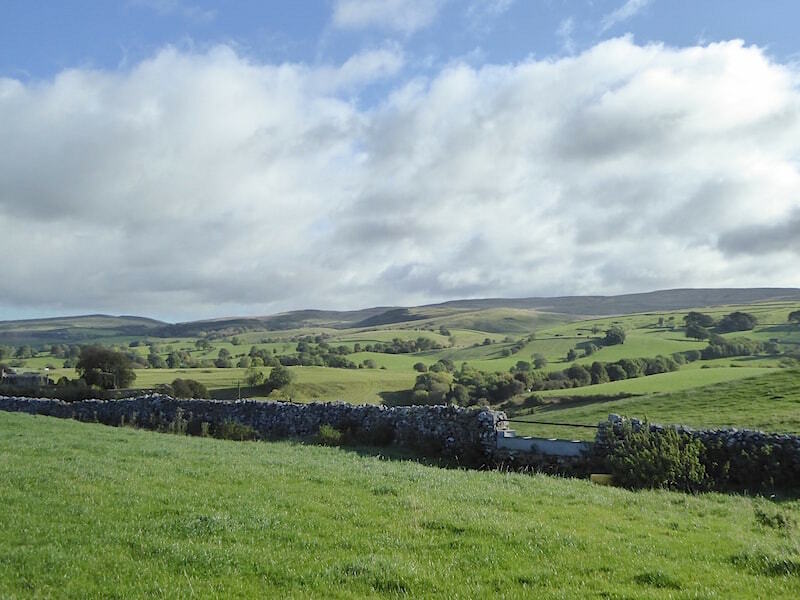 We’re crossing the fields beyond Wharton Hall now with this north easterly view towards Hartley Fell on the right skyline. The summit of Hartley Fell being Nine Standards Rigg where we walked in May this year. The field walking comes to an end by this cluster of houses on the eastern side of the railway line near Moor End. There wasn’t a soul about but the end cottage, nearest the camera, had an outbuilding full of hounds which immediately started howling and baying the minute they clapped eyes on us. Fortunately they couldn’t get out but we got a very good idea of how it might feel to be a fox on the run. 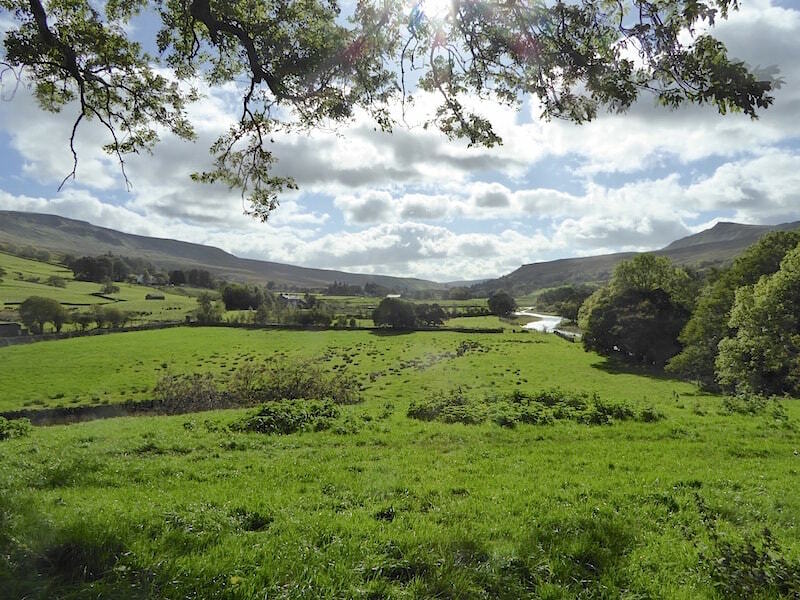 A short walk along the lane behind me brought us out on the narrow lane to Bullgill …..
….. and below Bullgill this lovely view down to the River Eden with Mallerstang Edge beyond it. 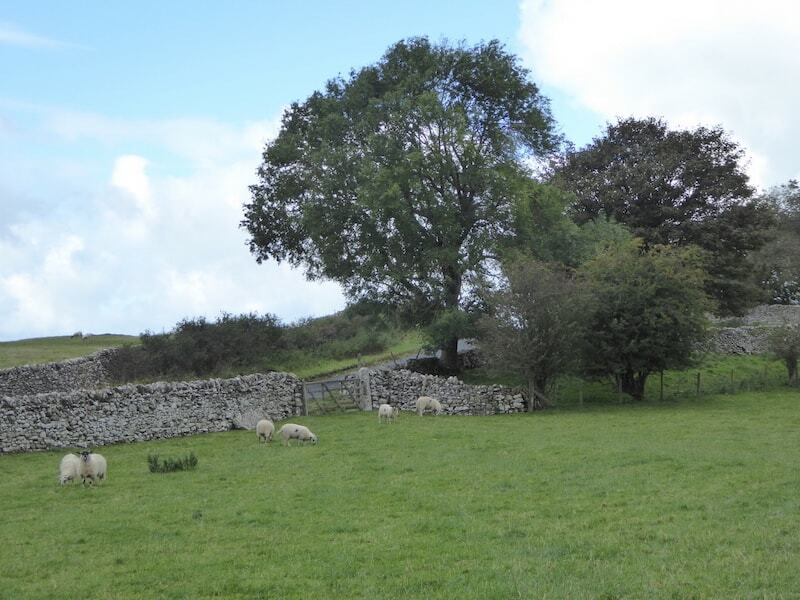 We continue down the road and eventually turn off to the left down to a gate in the wall, where the line of sheep is, to walk over to Lammerside Castle. 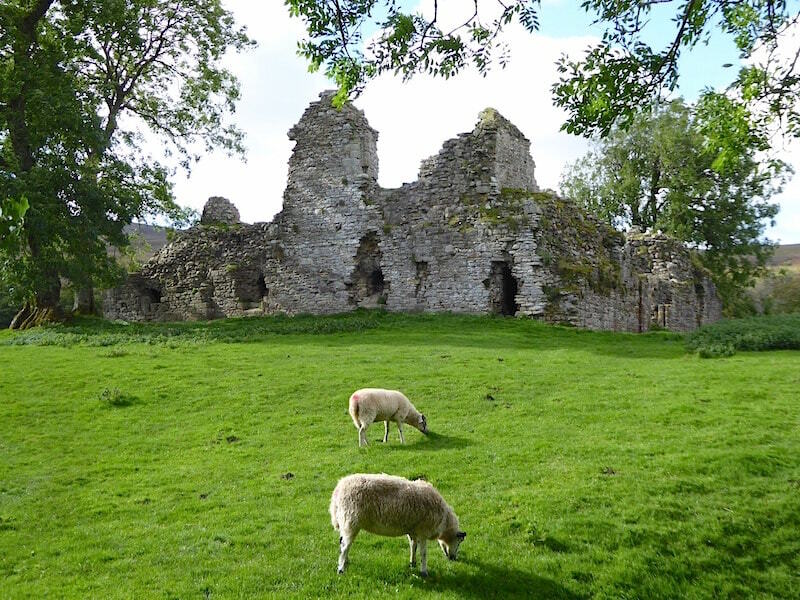 When we’ve had a look at the castle we’ll return to the gate, take the path immediately to the left of it, again where the line of sheep is and continue on over to the bridleway which can be seen to the right of the shot. 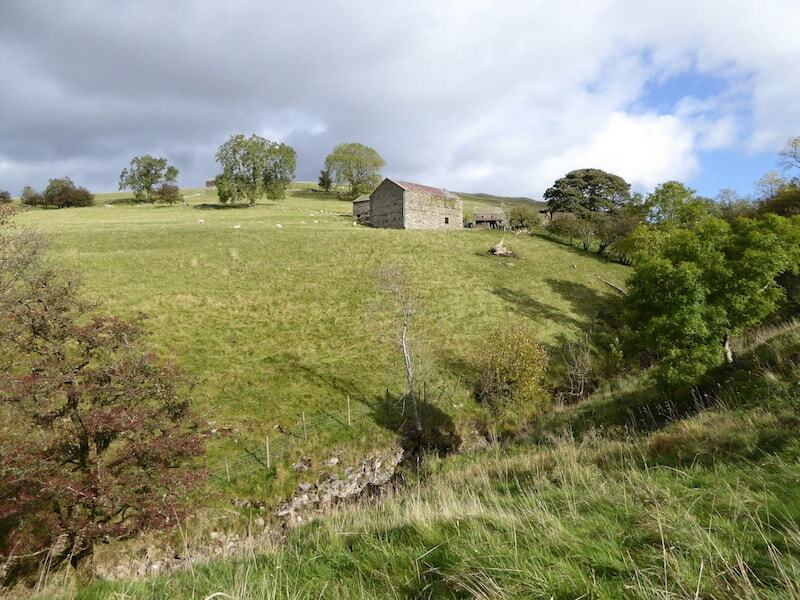 An even earlier building than Wharton Hall is Lammerside Castle on the lower slopes of Wharton Fell. 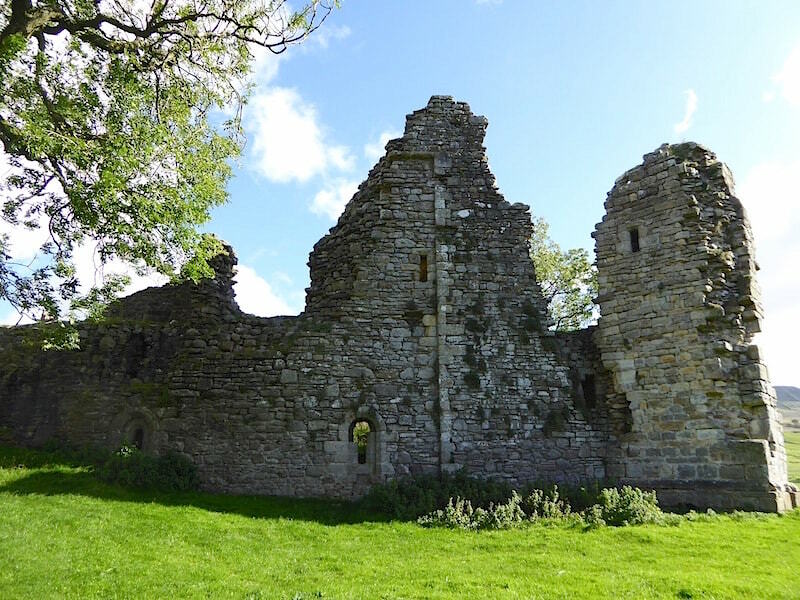 Dating from the 12th century and rebuilt and strengthened during the 14th century as a Pele tower to provide protection against raiders from north of the border. This view shows the eastern and southern elevations. 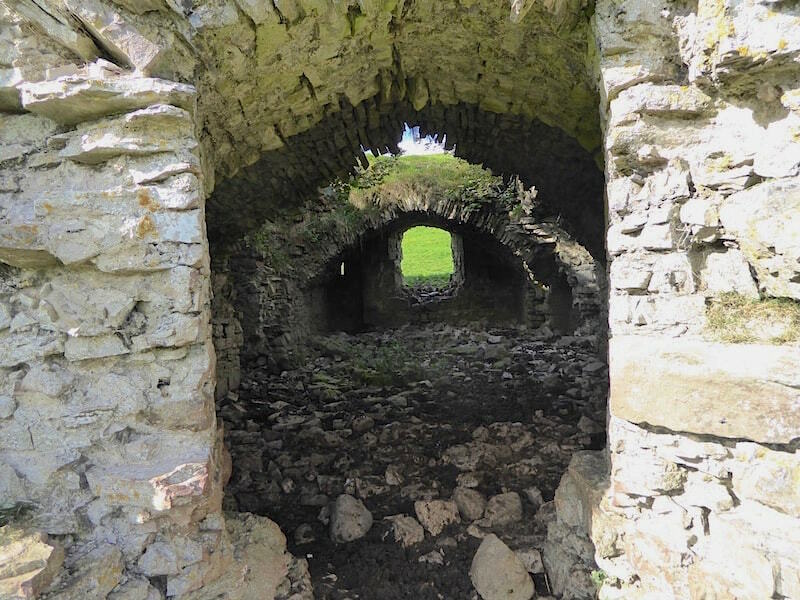 A peep inside the castle on its eastern side reveals the vaulted ceilings of the ground floor, although their height is much reduced by the amount of rubble which has accumulated on the floors below. The view of the northern side of the castle. I don’t know how tall it would have been originally but the remains clearly show that it rose at least to second floor height. The castle’s western elevation which clearly shows the thickness of the walls, at a rough guess about 4.5′ thick. 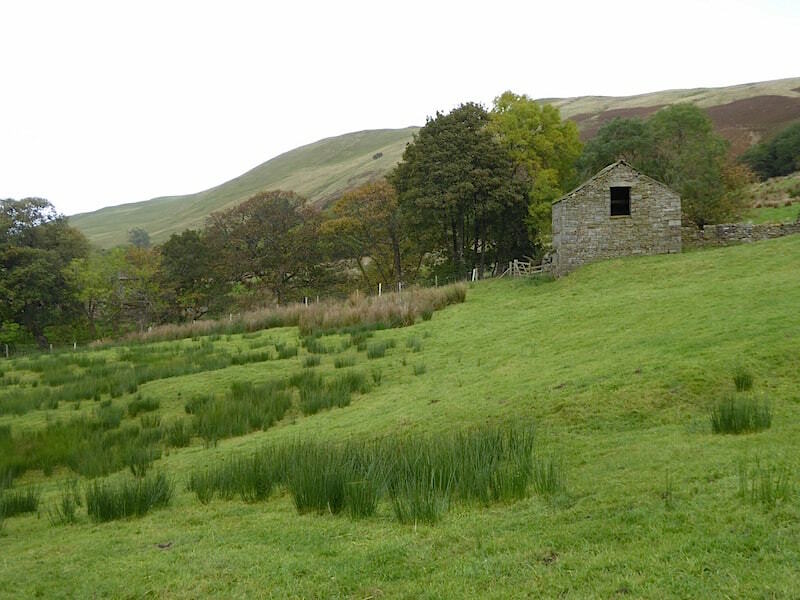 There are lots of rough mounds around which suggest that originally there were other buildings close by but which eventually fell into ruin and then became overgrown. 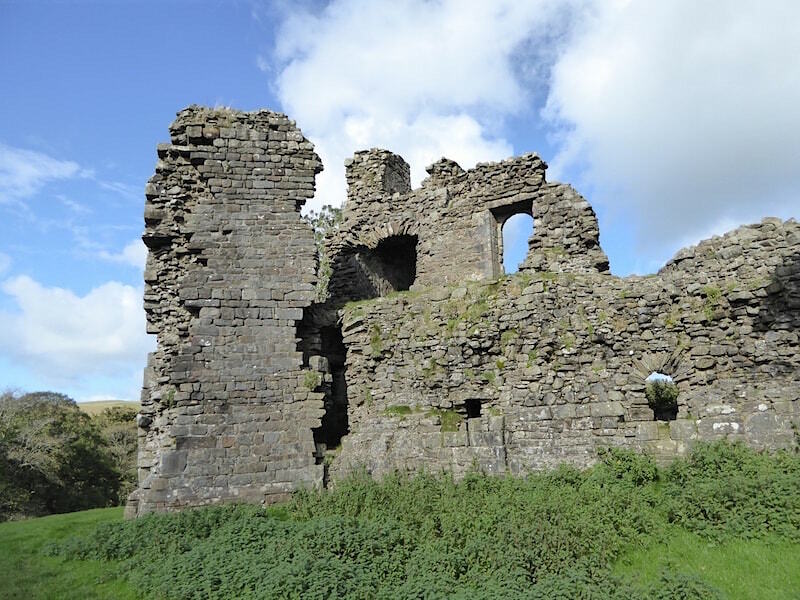 The northern and western elevations of the castle where, at the corner of the two walls the remains of a spiral staircase can be seen. All in all it appears to have been quite a modest dwelling, although judging by the architectural features it has it would probably have been quite a lot better than the homes of most of the people of that time. 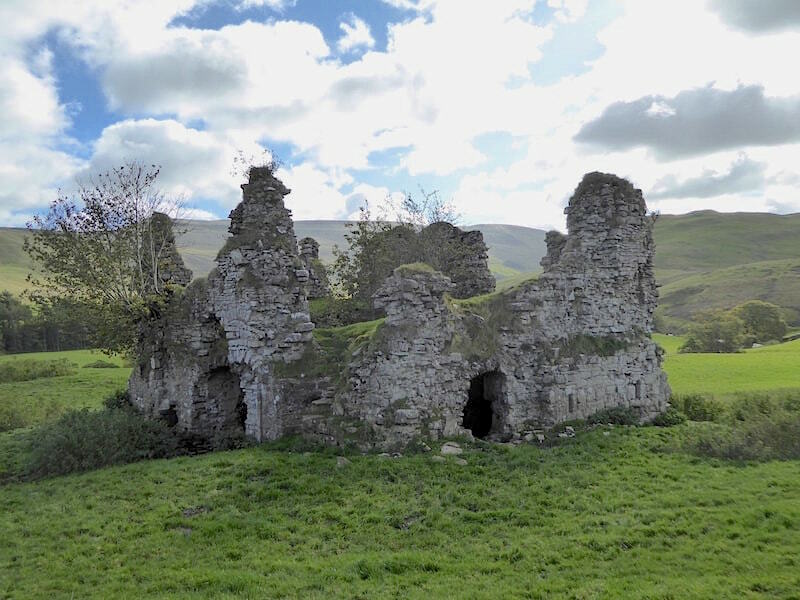 Once occupied by the Warcop family and later by the Wharton family who, it is believed, abandoned it when they moved into Wharton Hall a mile or so to the north. Heading back towards the gate where we entered the field, having dropped down from the road where Croop House Farm is standing. 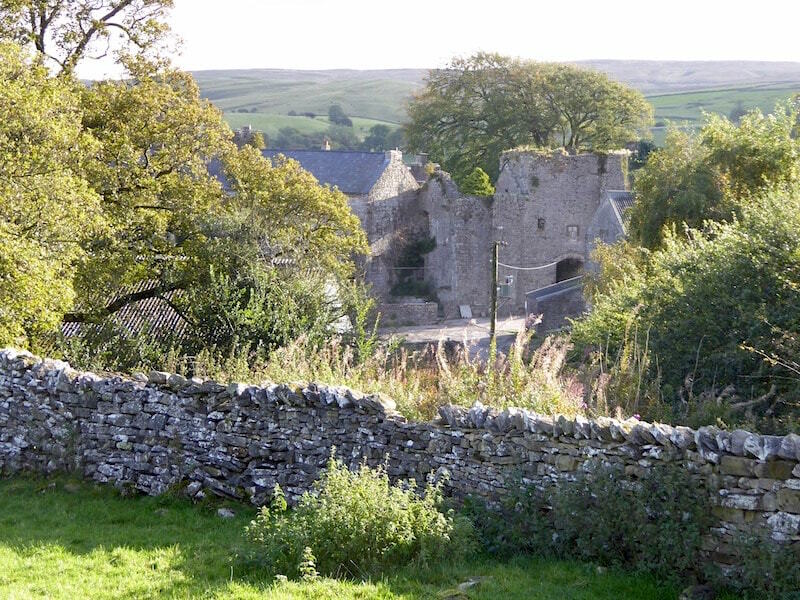 After a good look around the castle we make our way back to the field gate where we will immediately turn left and head for the bridleway beside the river. Croop House Farm on our right as we cross the field. 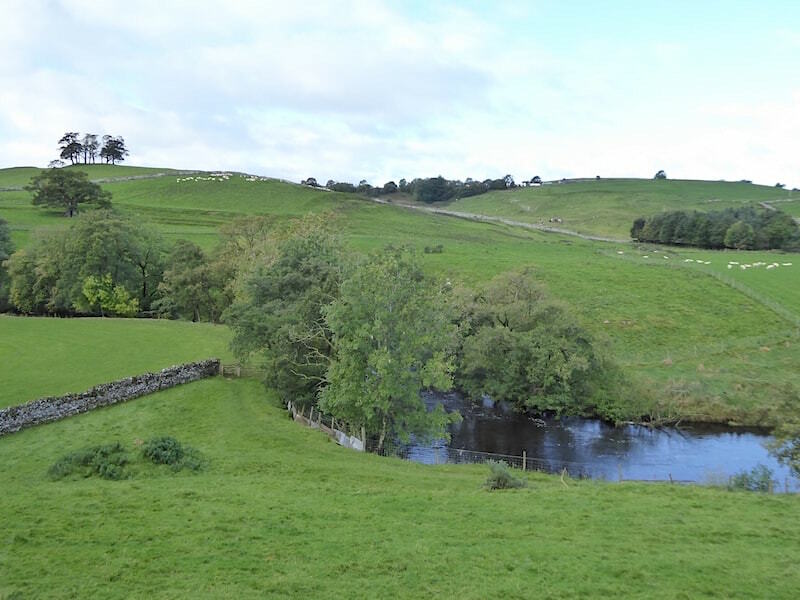 We reach the bridleway hugging the banks of the River Eden. 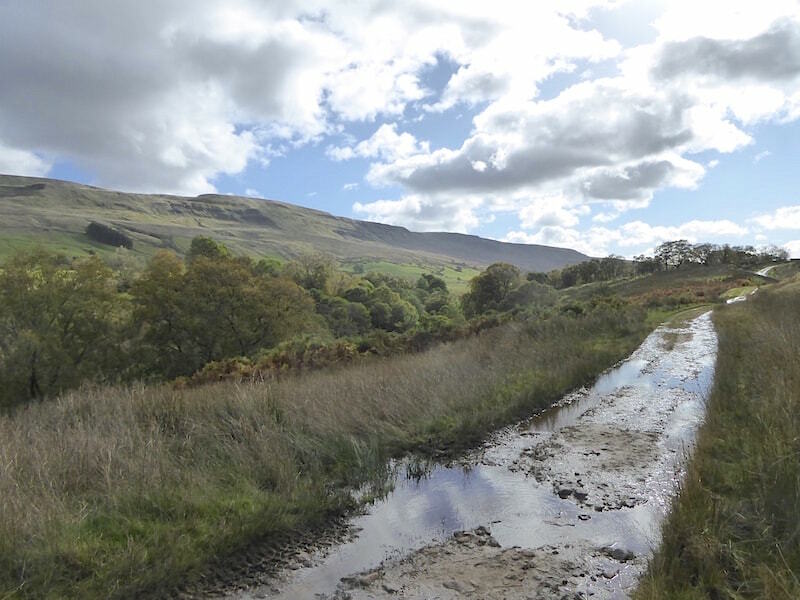 Unfortunately for walkers this is a BOAT (byway open to all traffic) highway, and heavy, motorised vehicles which have travelled along it have left deep ruts along the way most of which, further along, were full of water. The cloudy grey morning had developed into a bright sunny one so I took a look back at the castle as we walked by the river. The trees are not quite showing their full autumn colours yet but it won’t be too much longer before they do. Pleasant walking along the river as it meanders along. 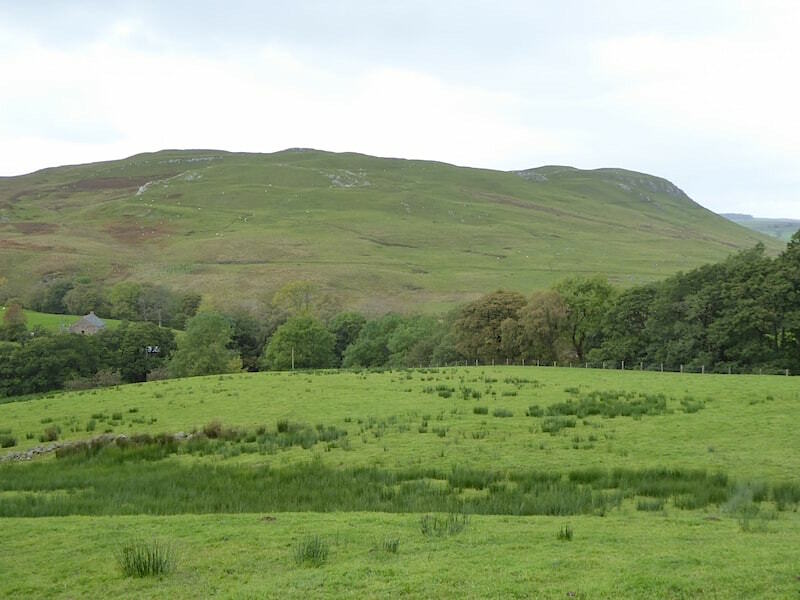 You might be able to pick out some campers and their caravan in the middle distance below Great Bell. They’ve chosen a glorious location for their stay. 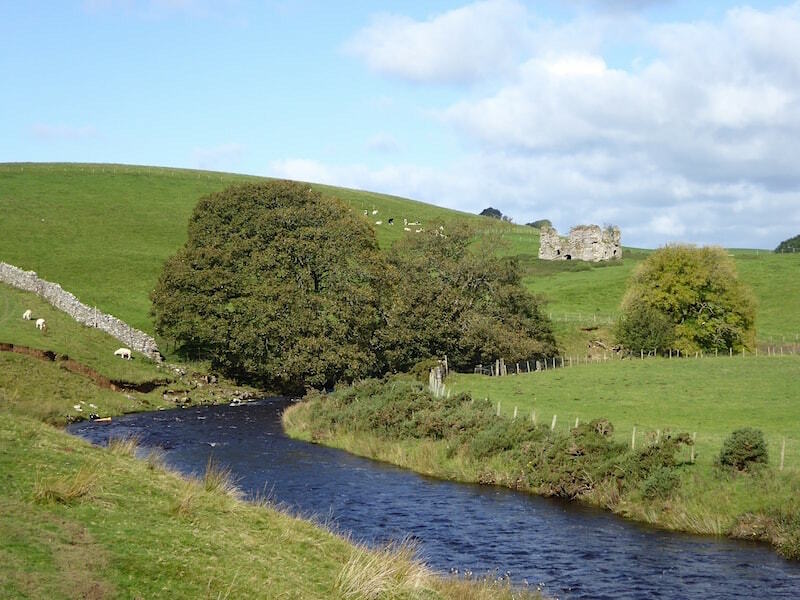 Another look back at Lammerside Castle as the path begins to swing away from the river around the lower slopes of Birkett Common. What you are left with after heavy rains on a byway open to all traffic. Walking along here was trying beyond description and it didn’t improve until a long way further along where the ground began rising once more. 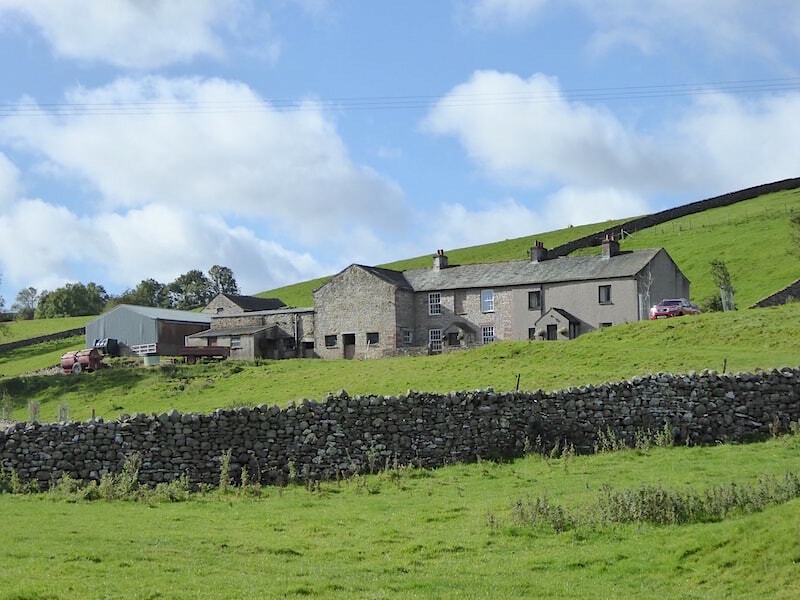 Below Great Bell is Dalefoot Farm, home to the Country Fare Bakery. 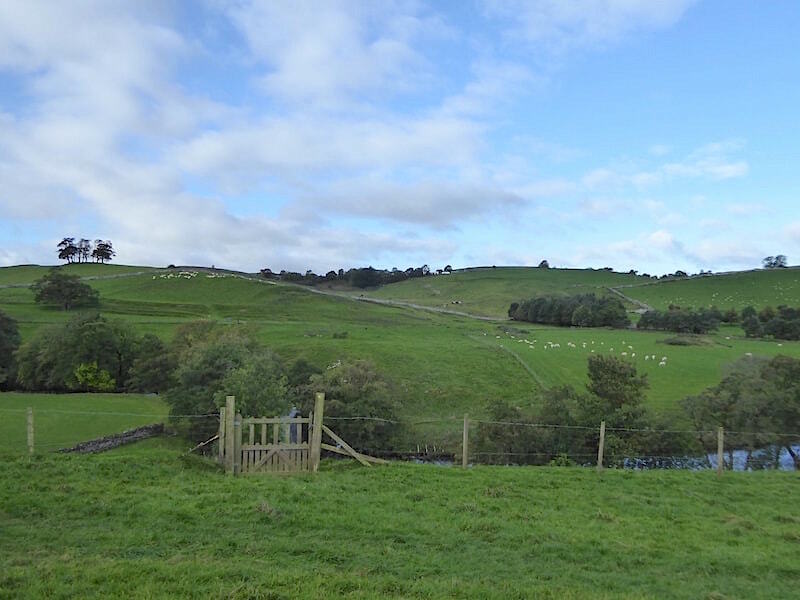 Our return leg will see us walking back to Nateby on a path over there above the intake wall. 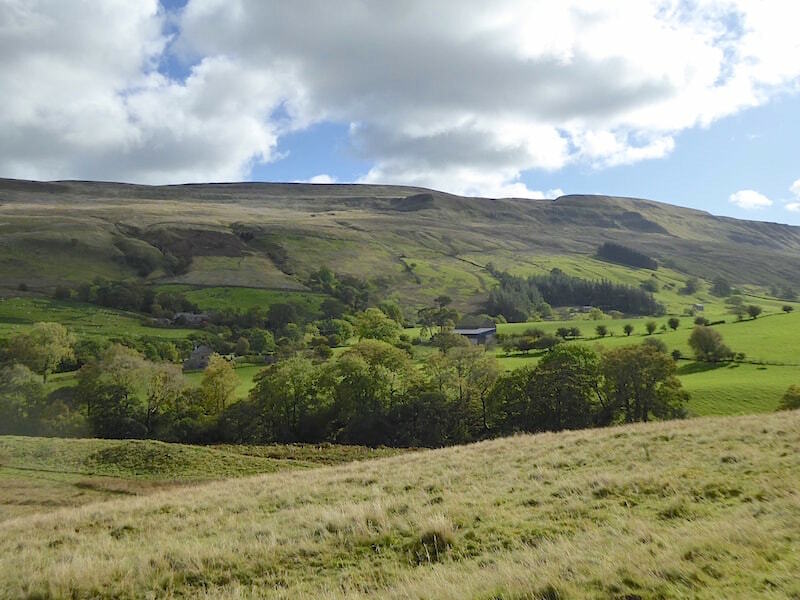 Walking the bridleway on the lower slopes of Birkett Common with a view eastward towards High Pike Hill across the Mallerstang Valley …..
….. and a little further south towards Mallerstang Edge. Lime kiln and limestone outcrops on Birkett Common just before we reach Tommy Road. It was around this point that a thirty something guy with his female companion came by us in a Land Rover Discovery, I am reliably informed that’s what it was, because I take little interest in the make of any type of vehicle. It would have to be a hen coop on wheels before I sat up and took notice. They were no doubt enjoying their off roading adventure, oblivious to the consequent damage to the already badly eroded bridleway, and gave us a cheery wave as they splashed their way past us. I gritted my teeth and bit back a few choice remarks (insults). 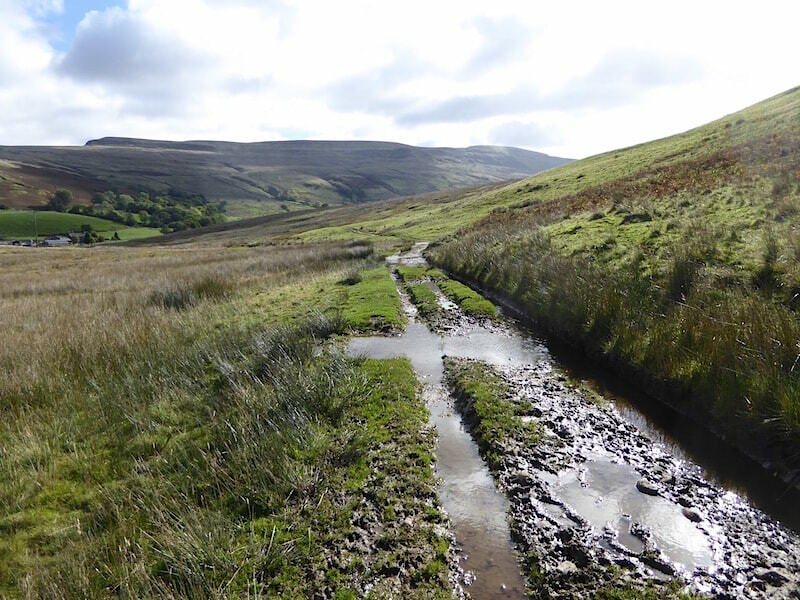 The 4 x 4 has disappeared and we walk just a short distance along to the end of the claggy bridleway where it meets a lane known as Tommy Road, which on our route map is the thin yellow line coming across Wharton Fell. 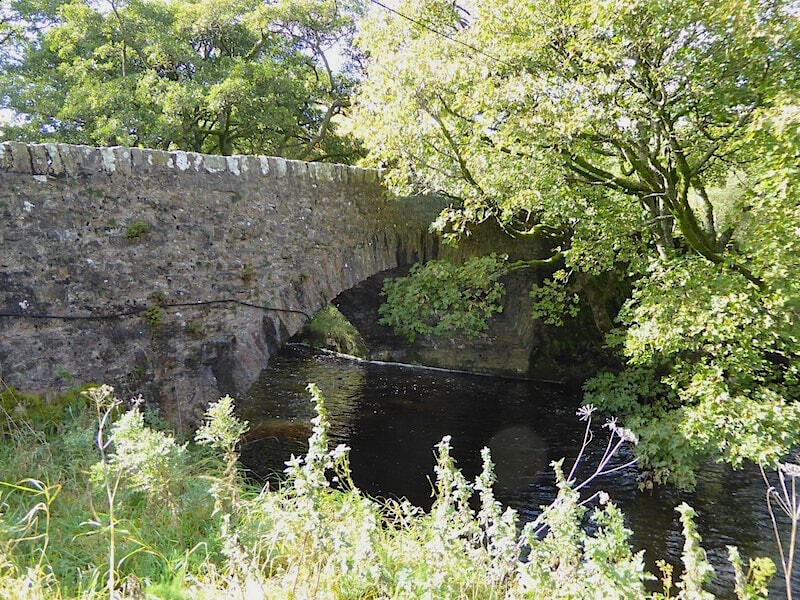 A look back at Birkett Common as we reach the end of the bridleway …..
….. where we join Tommy Road to take a left turn over the cattle grid and head downhill towards the river …..
….. where we cross Castle Bridge, a Grade II listed building and thought to date from the 1600’s, over the River Eden. From the bridge we follow the lane around to its junction with the B6259 with Mallerstang Edge opposite us across the valley. 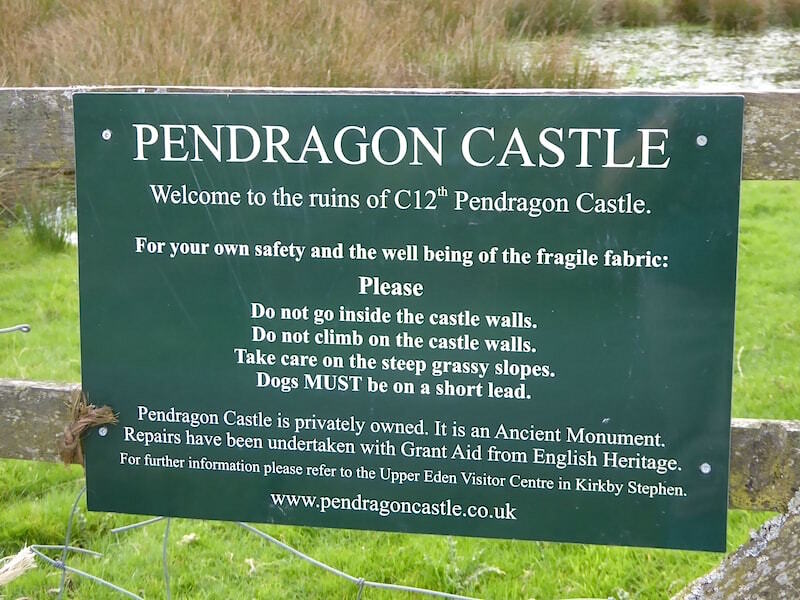 Immediately behind me at this point is …..
….. Pendragon Castle and the info board attached to the gate. The view of the castle as we pass through the gate and walk across the field. 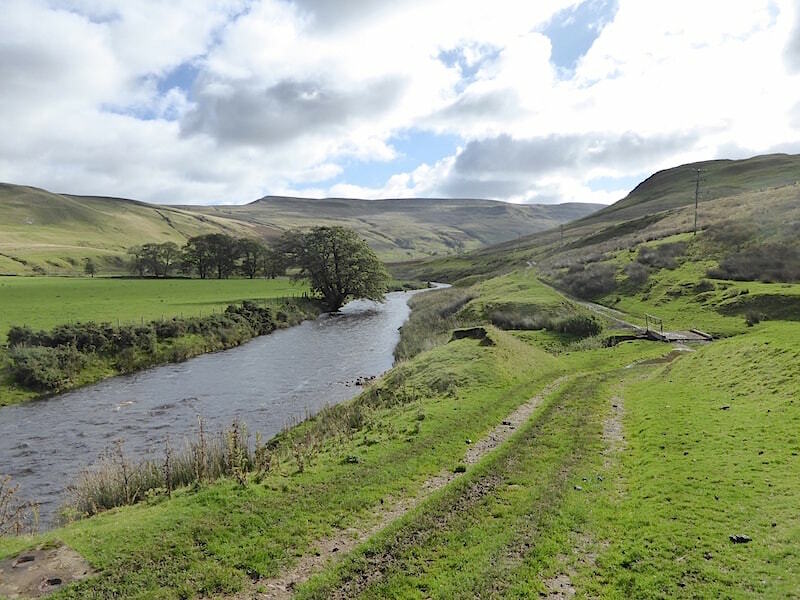 Now, this is one of those places where the romantic Arthurian legend rears its head again as it is reputed to have been founded and occupied by Uther Pendragon, supposedly in the 5th century. You’ve no doubt heard of him and his more famous son, Arthur, supposedly the one time king of Britain who defeated the Saxons and established a great empire, well that’s if you believe Geoffrey of Monmouth’s tales. In between all of that he had a huge round table built and organised a band of knights around him, and the table presumably, and set about being a great warrior with his magical sword Excalibur. Its all good stuff and very entertaining but his existence is debated and disputed by scholars to this day. The castle which stands here has been dated back to the early 12th century so Arthur and his dad were long gone by the time this was built. Before we explored the castle we found a sheltered spot on the south side of it where some handy stones offered convenient seating and settled down to have some lunch. 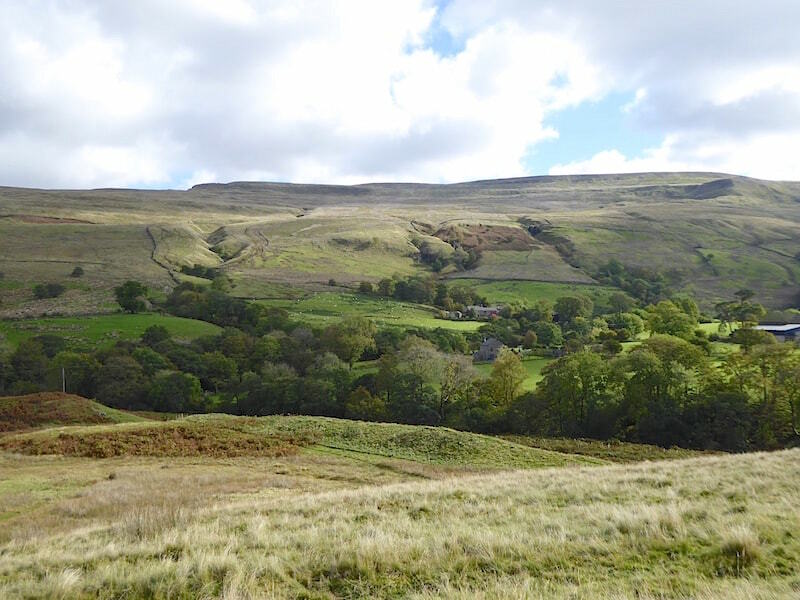 This was our view over towards Mallerstang Edge as we tucked in to our sandwiches. 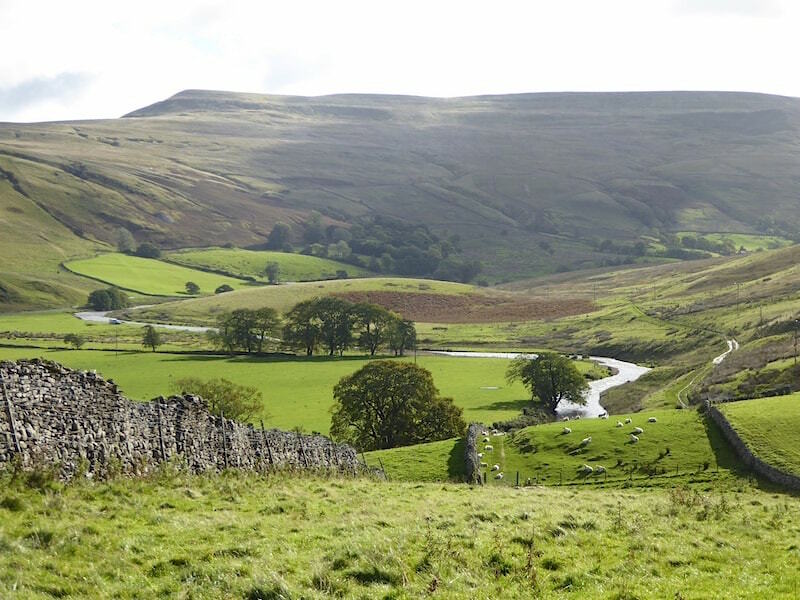 On our right was the River Eden and soaring above it is Wild Boar Fell where we walked just one week ago on a day very similar to today. A closer look at the Edge while it was bathed in sunshine for a while. 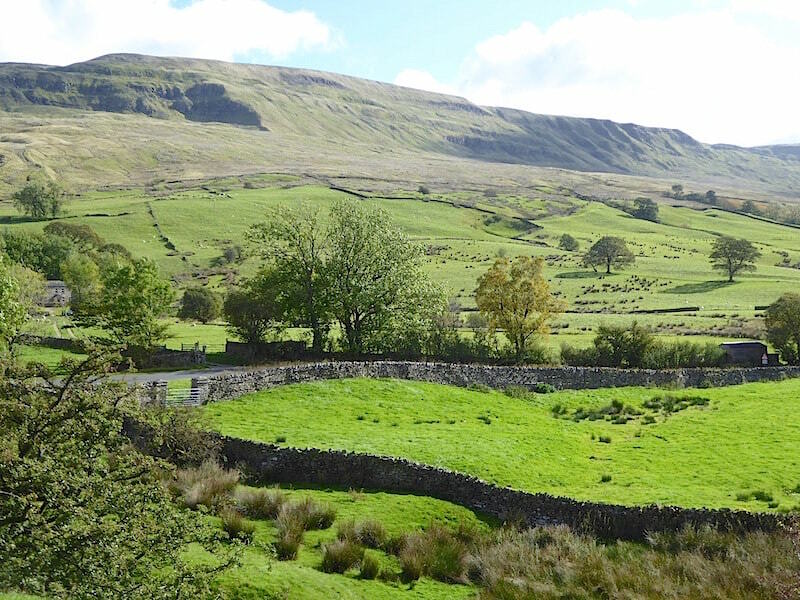 With our backs to the castle wall, and the wind, we were looking directly to the south along Mallerstang and enjoying the view along with the sandwiches. The strong wind was roaring through the trees above us and giving the branches a right old pounding with bits of twig and leaves flying off all over the place. Lunch over and everything packed away once more, we turned our attention to having a good look around. This is the south side of the castle. 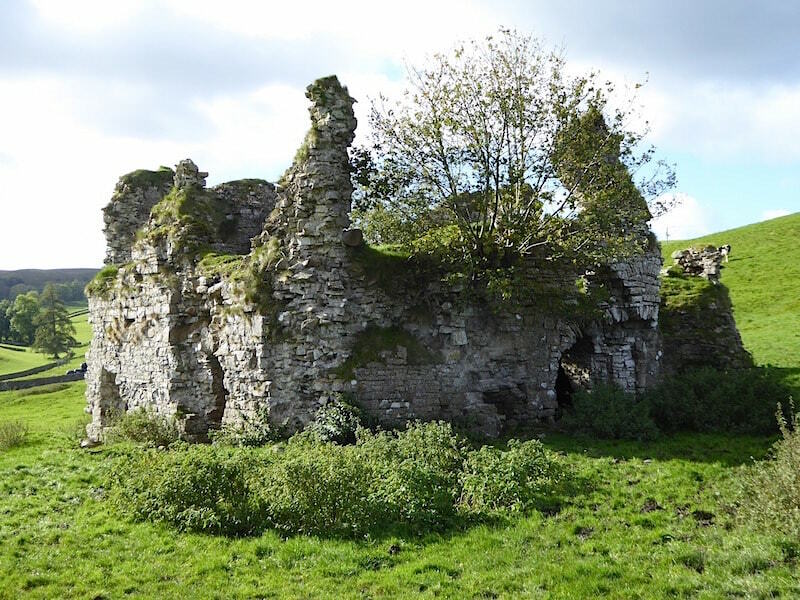 One owner of it was Sir Hugh de Morville, Lord of Westmorland, who you may have heard of during some history lesson or other when you were at school. His name rarely springs readily to mind but a name associated with him might be much more familiar, Thomas Becket, Henry II’s troublesome Archbishop of Canterbury. Hugh de Morville was one of the band of four knights who decided that they would go and sort out this bothersome priest once and for all, which they did on 29th December 1170 by murdering him in Canterbury Cathedral. The western side of the castle. 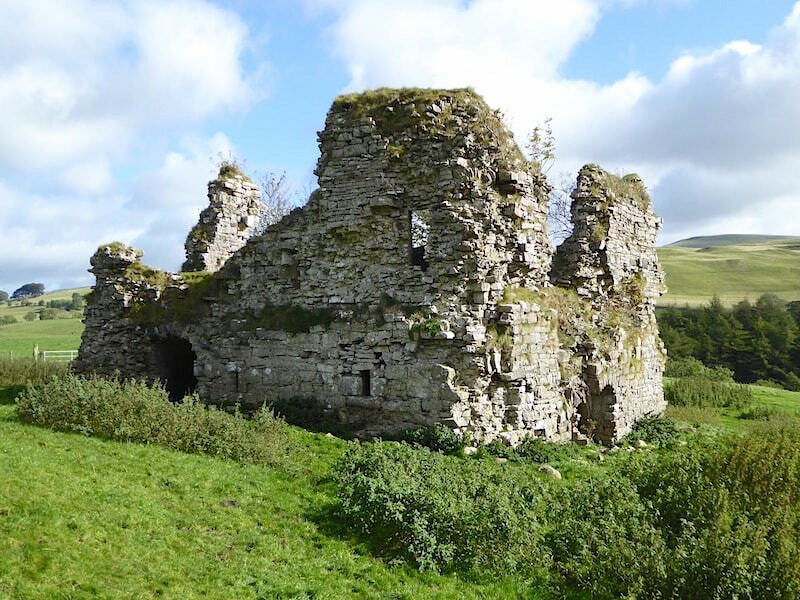 The castle was badly damaged during a raid by the Scots in 1341 but it was largely restored again some time later. Unfortunately it suffered another attack in 1541 and was left in ruins for the next hundred years or more. 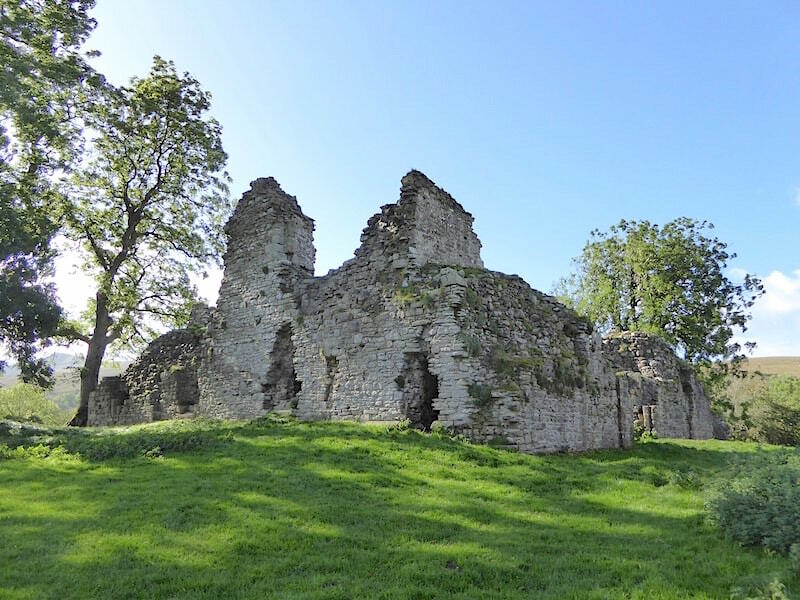 In 1643, after she had fought decades of long and complex legal battles, the castle eventually passed into the hands of Lady Anne Clifford whose extensive property portfolio included the neighbouring castles at Appleby, Brough and Brougham in addition to her family seat of Skipton Castle. A formidable and determined Yorkshirewoman she set about restoring all the property in her possession once she had finally, and rightfully, got her hands firmly back on them. In such difficult times for women, you have to admire her for fighting her corner against her two husbands and all the other powerful blokes around her, including King James I, all of them seemingly determined to prevent her from gaining possession of property which was legally hers. Good for you, Lady Anne. By way of a memorial she has a long distance walk named after her, Lady Anne’s Way. 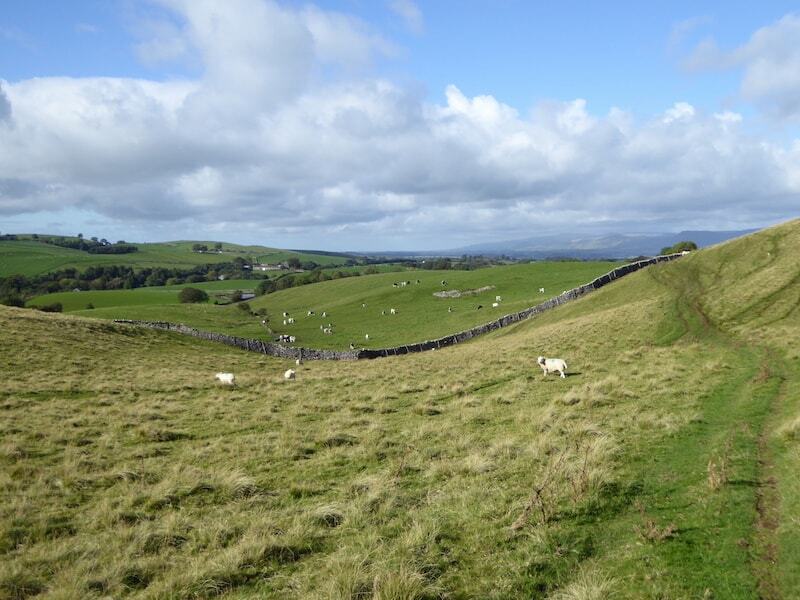 This is 100 miles in length and traces her journeys to her many properties between Skipton and Penrith. 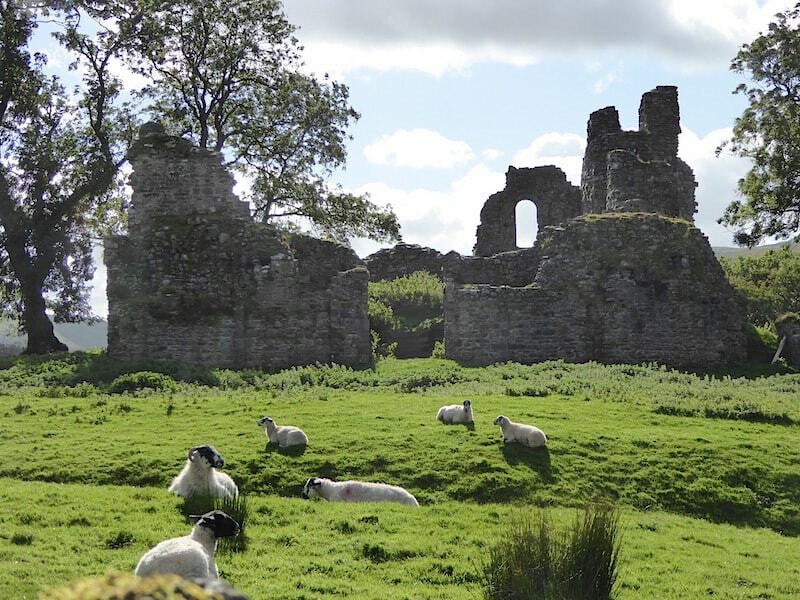 The route passes alongside Pendragon Castle. The north side of the castle has had some wooden steps installed which allows access to the small keep and enables you to view the castle from a more elevated perspective. 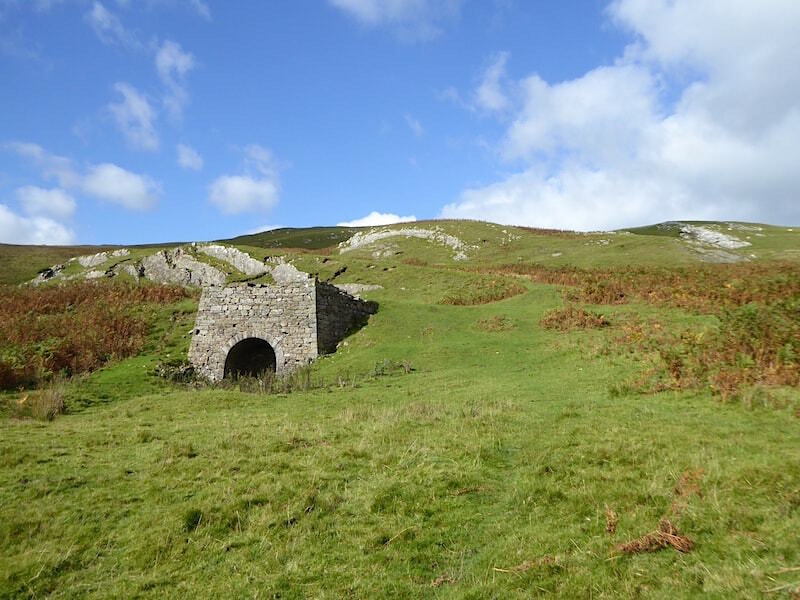 The whole structure is surrounded by a deep earthwork ditch, which may have been water filled at one time, and is crossed by a couple of walkways. From the top of the steps the view towards the northern end of the Mallerstang valley. 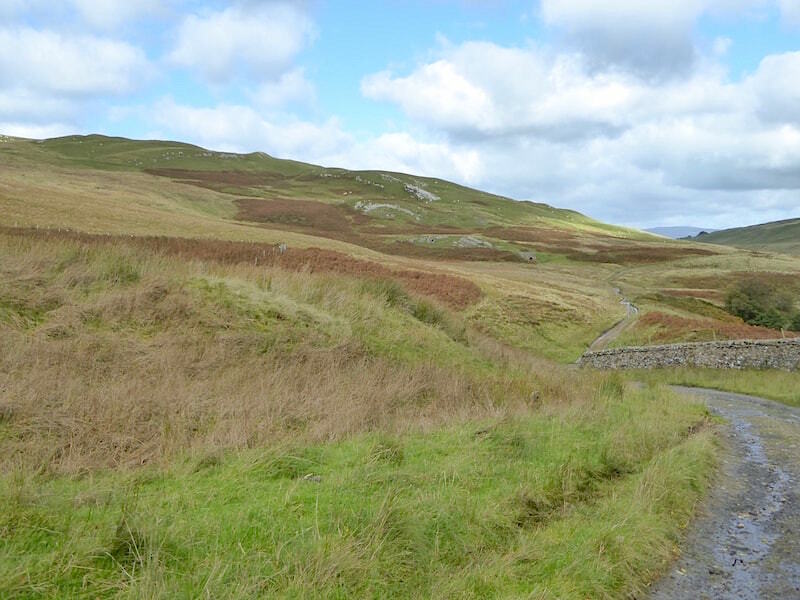 The road we walked along to reach the castle is immediately on the other side of the wall in the middle foreground, and the earthwork ditch can be seen dropping down in front of it. 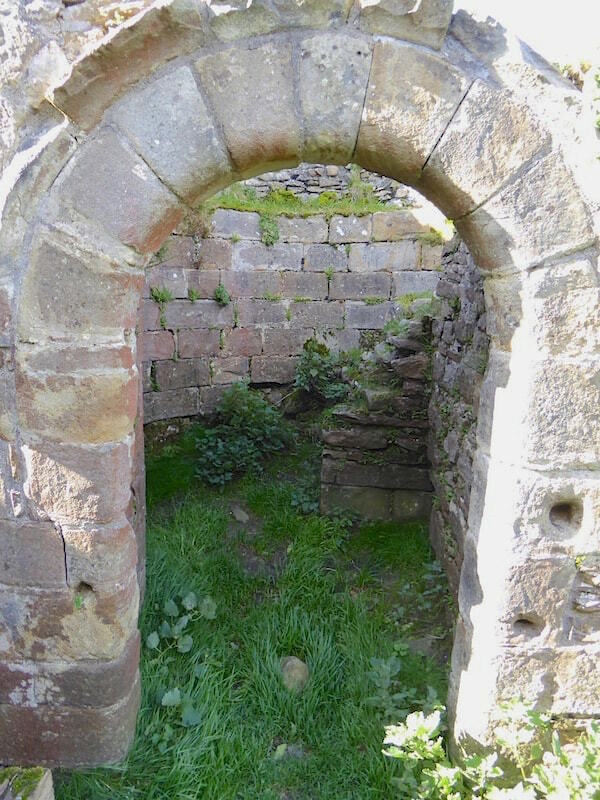 On either side of the steps are gatehouses or towers and …..
….. at the bottom of the steps a peep through one of the gatehouse doorways reveals the remains of a spiral staircase and draw bar holes, both of which were also visible in the matching gatehouse behind me. 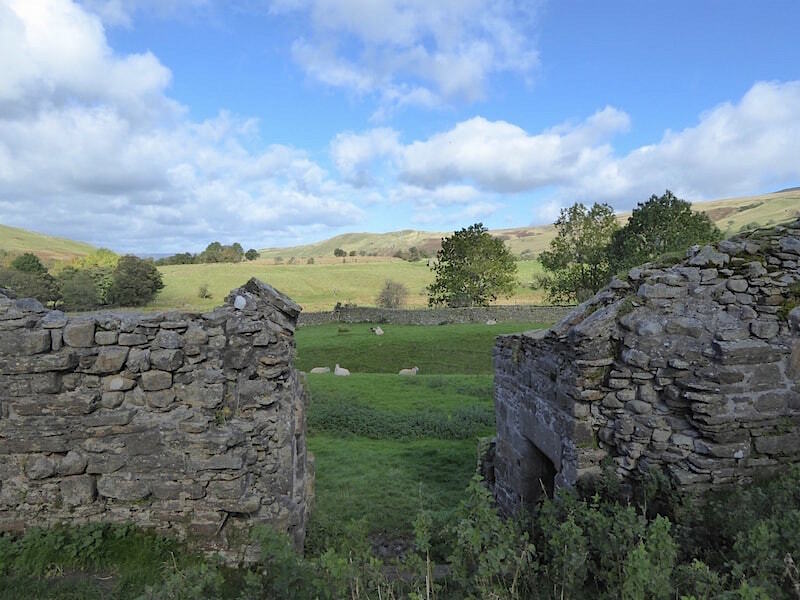 I would imagine that the gap between the two gatehouses would have been filled by a sturdy door which would have been further strengthened by stout wooden poles placed in the draw bar holes behind it. The afternoon sun filters through the surrounding trees keeping the north eastern aspect of the castle in dappled shade. We take our leave of the castle with a look back at its now shaded eastern and southern walls. 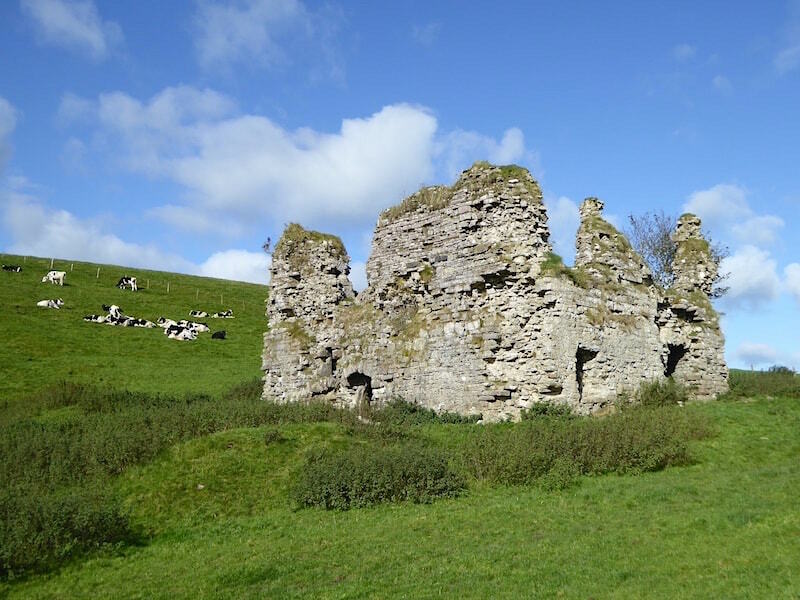 We rejoin the road and retrace our steps back to Castle Bridge with another look back at Pendragon Castle over the wall along the roadside. 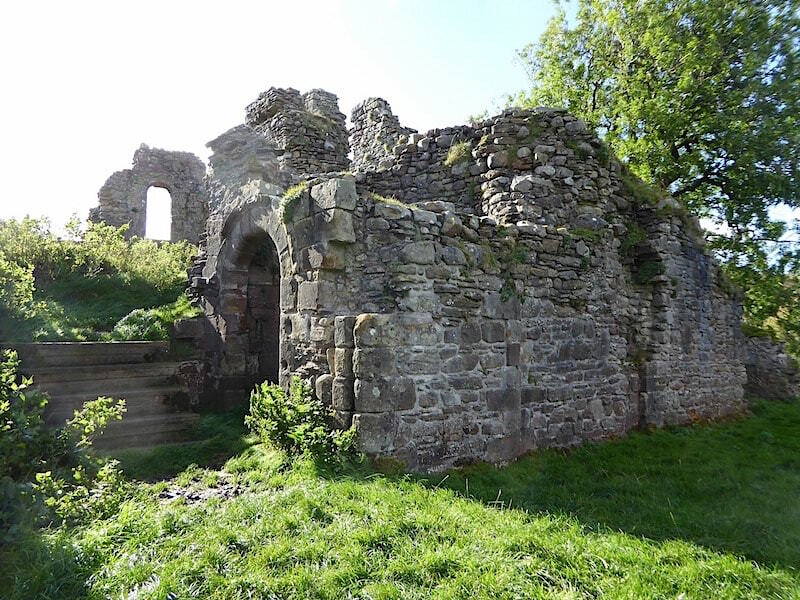 The wooden access steps are in the centre just beyond the central opening with the two gatehouses on either side of it and you can’t help but wonder what tales those walls would tell, if only they could. 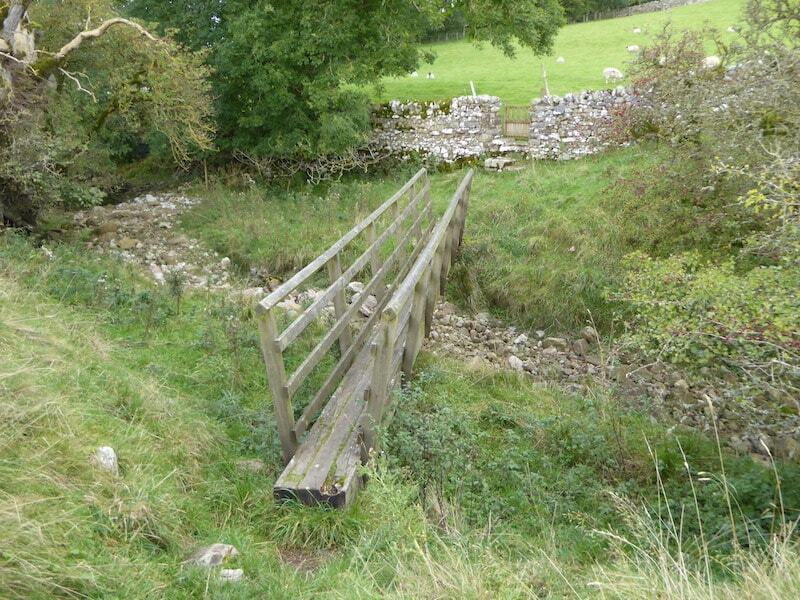 Back at Castle Bridge which we do not cross but instead squeeze ourselves through the narrowest of stiles and into the field beside the river. 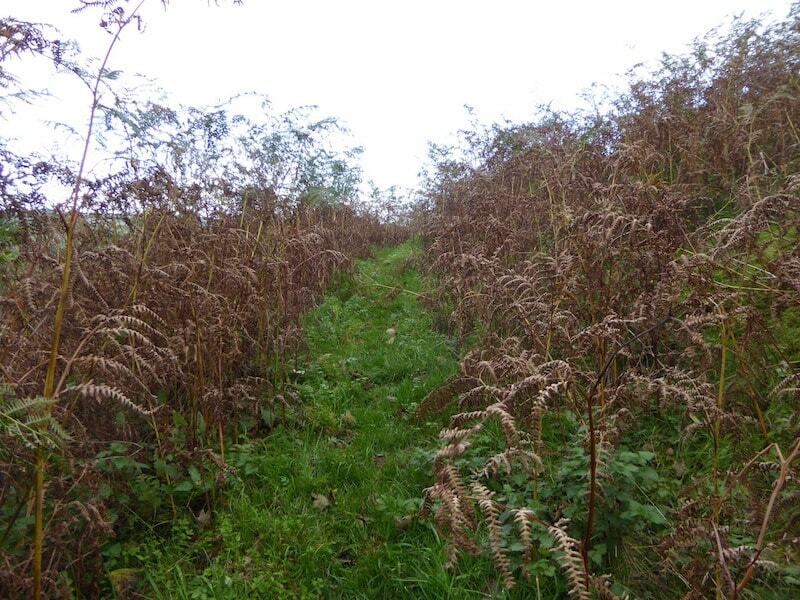 Up a slight rise at the end of the short field where we gain access to the next field via this old step stile. We had donned jackets while we were sitting eating our lunch but they soon came off once we were out in the warm sunshine again. 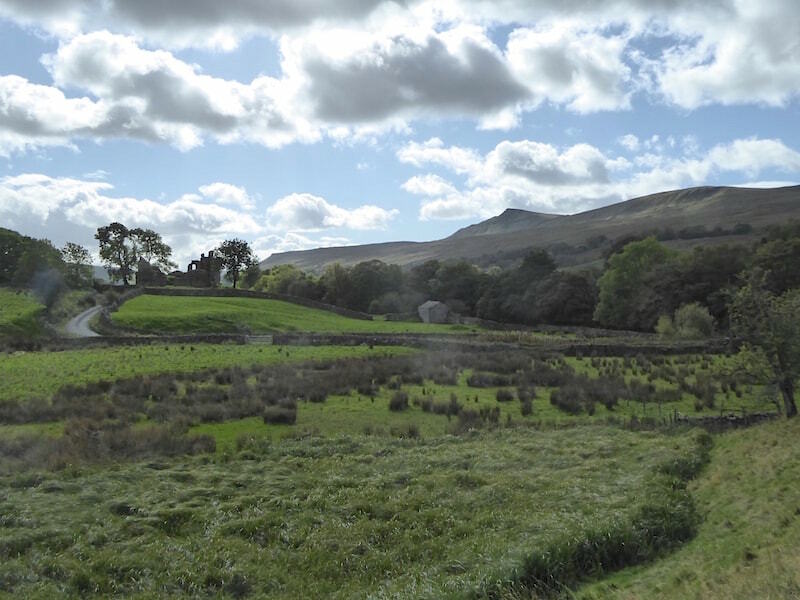 The stile is over to the bottom right of the shot as I take a look back at the silhouette of the castle, now over on the left, with Wild Boar Fell over on the right. The little lane from the bridge curving its way towards the castle and from there joining the B6259 running the length of the valley. 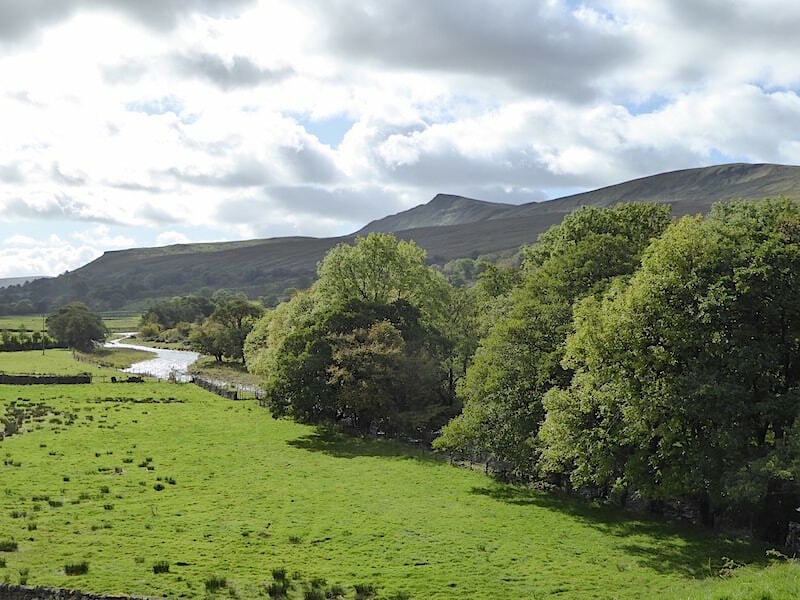 Apparently, travellers passing through the valley during the 18th century would likely be met somewhere along the route by highwaymen. One in particular being a native of the valley and who, according to local tales, escaped the clutches of the local constabulary when they arrived one night with warrants for his arrest. Apparently, as his sidekick was being apprehended, he broke through the thatched roof of his cottage and made off on one of the constabulary’s horses. We’re crossing the fields in a north easterly direction and making our way towards the point where the field path will tip us out onto the road again. 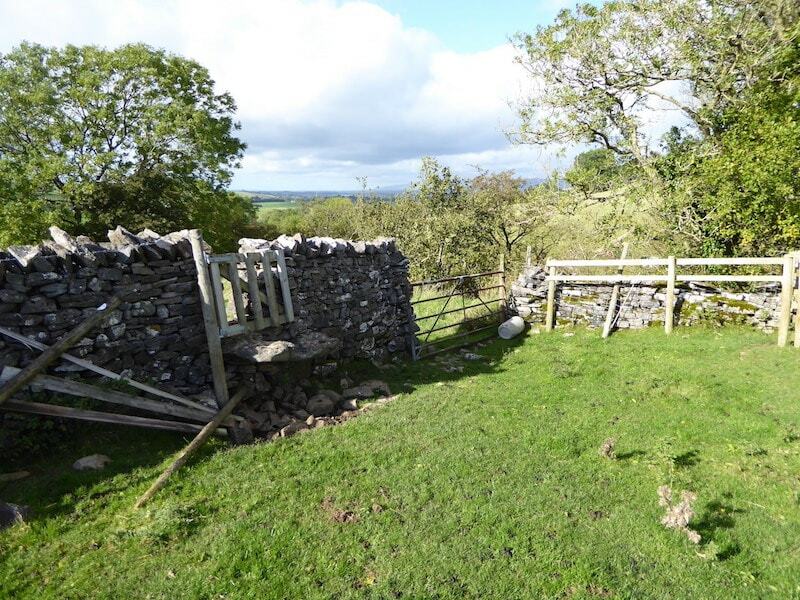 In the meantime there is another step stile to negotiate. 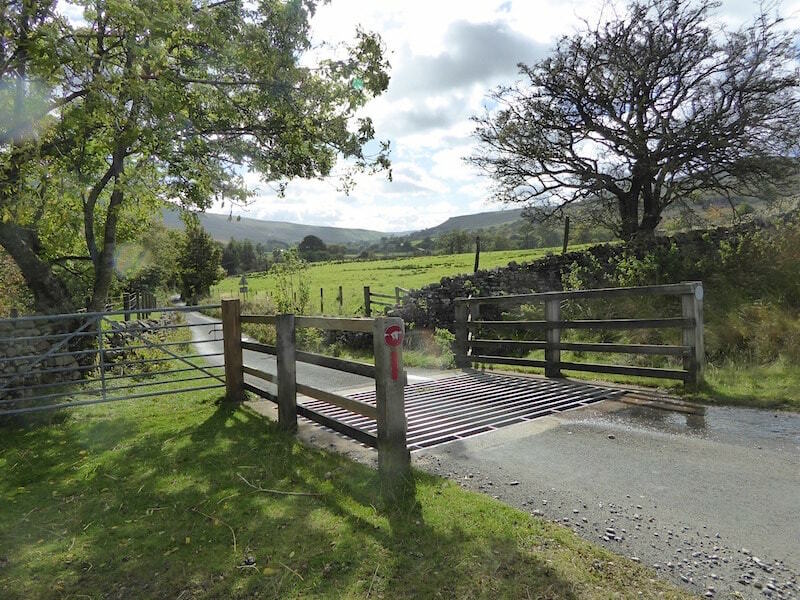 Once through the gate there is a very short section of road walking along to …..
….. Southwaite Farm where we take a right turn …..
….. and wind our way around the back of the farm. 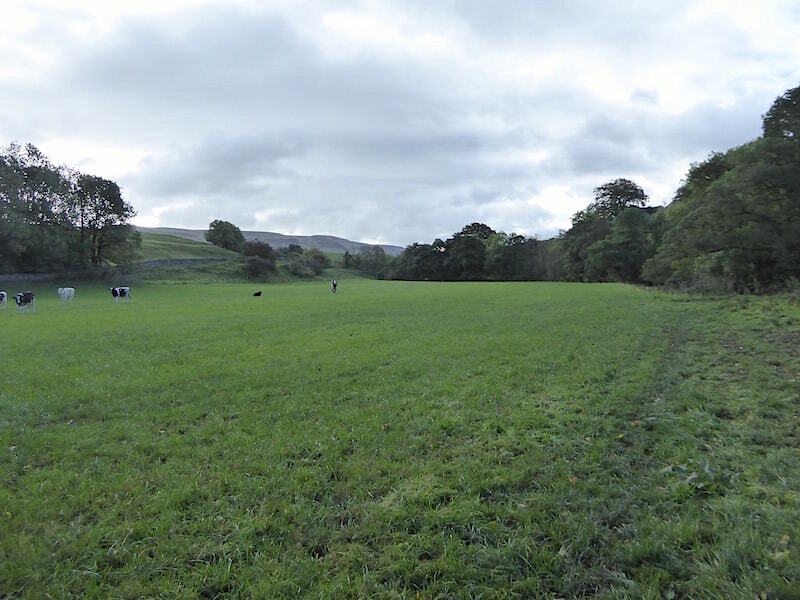 Just before we reached this point we had a chat with the farmer who was getting some of his ewes ready for tupping. There were lots more out in the fields and there are fifteen rams waiting to be let loose once the ewes are prepared. He’s going to be busy come next March/April then. The skies clouded over and it began to rain on and off as we continued on from Southwaite Farm. It wasn’t a downpour by any means and it was very light and intermittent so we didn’t bother putting the jackets back on. Looking over to Birkett Common, the bridleway we followed this morning can be seen running across its lower slopes. The blue sky has disappeared for the time being and we’re under a large patch of gloomy grey cloud as we continue on across the fields. 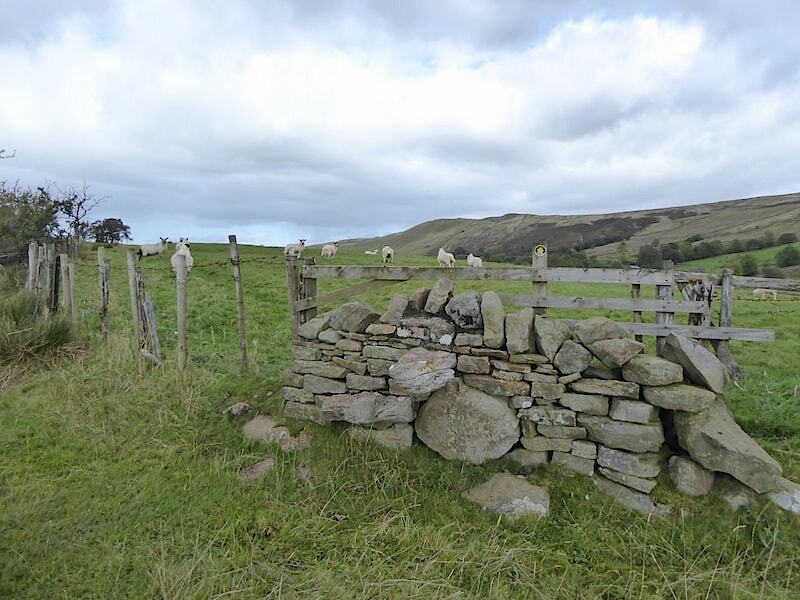 We go through the gate at the end of the field by the barn, turn right up the hill for a short way before dropping down to cross Southwaite Gill, then climb up the other bank of the gill, continue uphill a little further to another stile and on across yet another field. 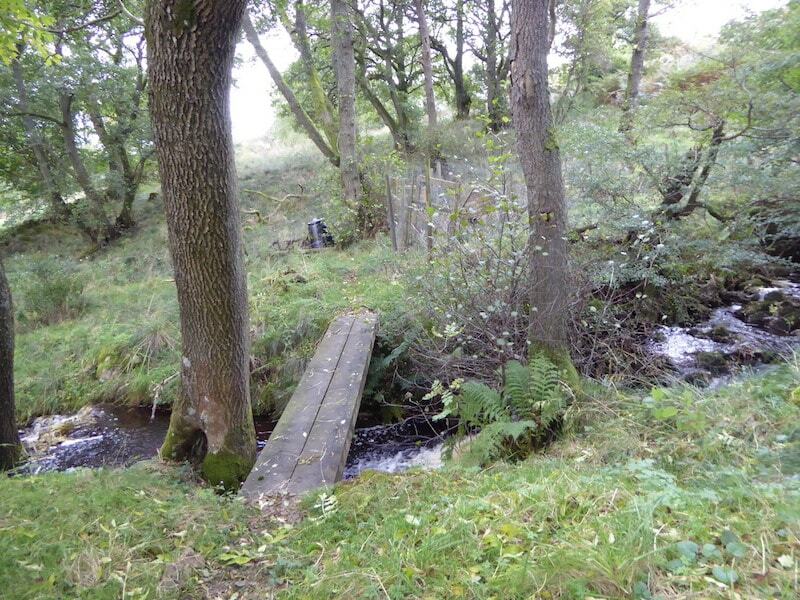 We pass through a small wooded area and cross another beck by means of this plank bridge, well studded with metal fixings to reduce the chance of slipping although the bouncing as we crossed over it was a little disconcerting. 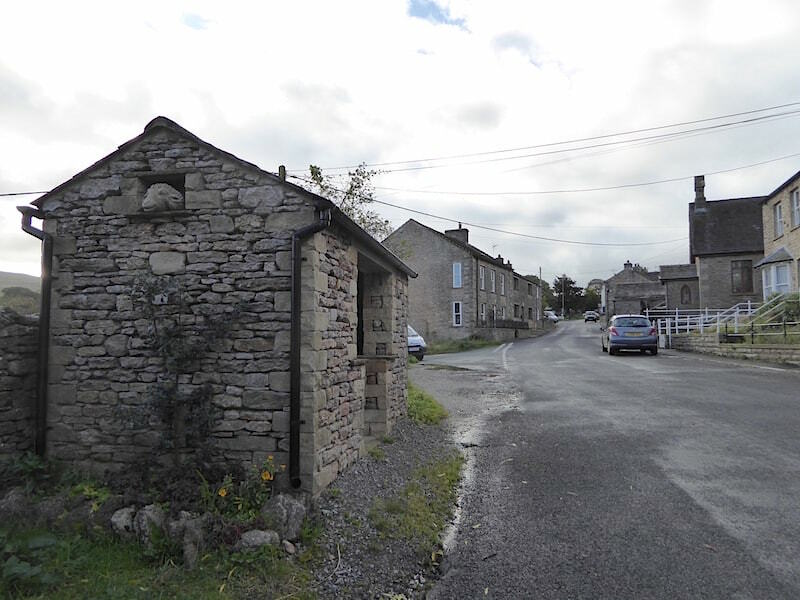 Just beside the beck crossing is this uninhabited house, its named as Carr House on the OS map but not named on the route map above. 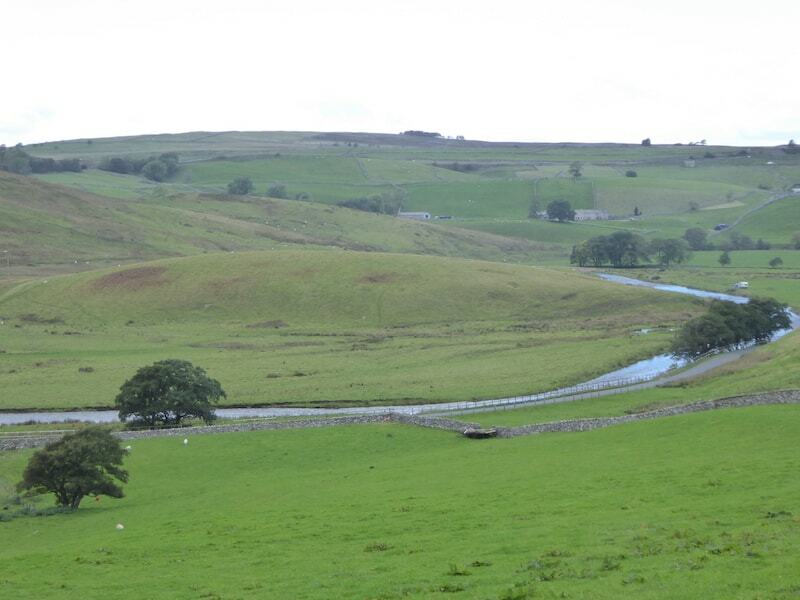 It is indicated on that map by a small square beside the beck just to the south of Dalefoot. 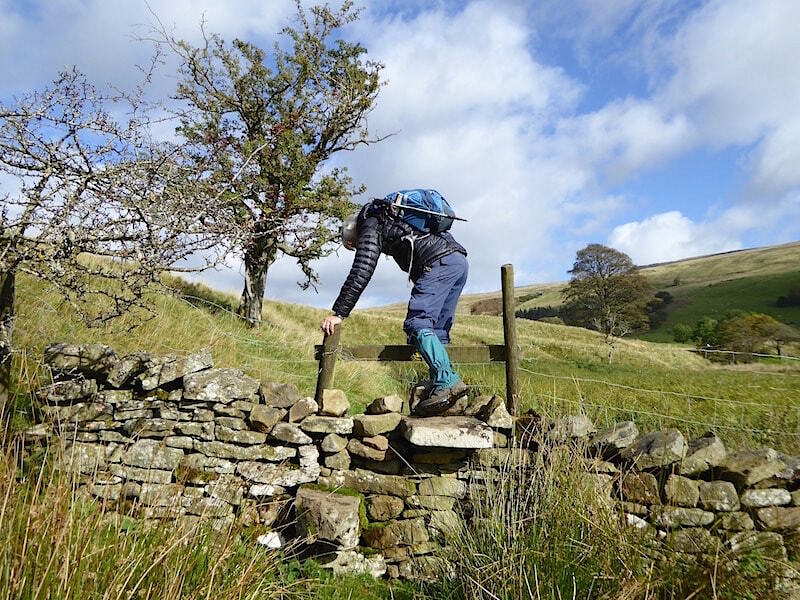 A helpful farmer has provided a hand painted waymarker so we obediently climb the stile and pass through the handgate behind it and continue on our merry way …..
….. through shoulder high bracken. 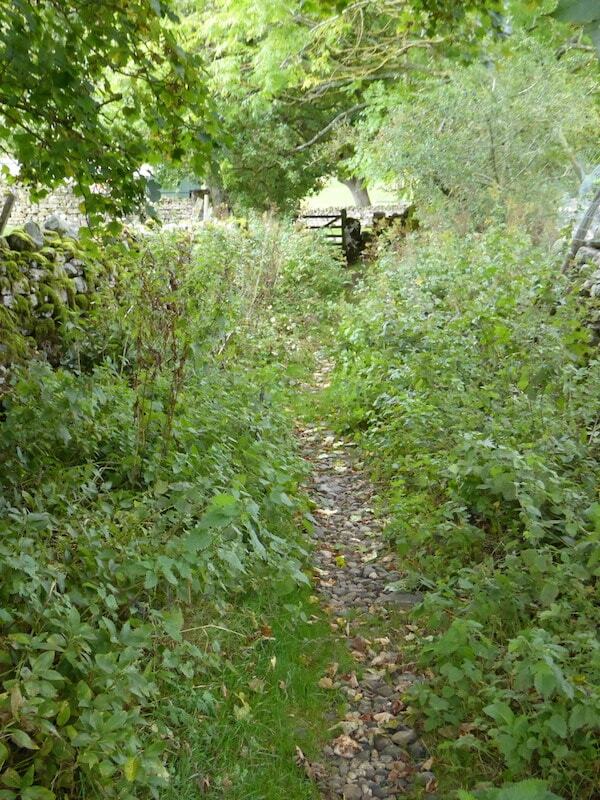 A couple of months ago this path might have been difficult to find and having found it there would have been quite a struggle to fight a way through it. 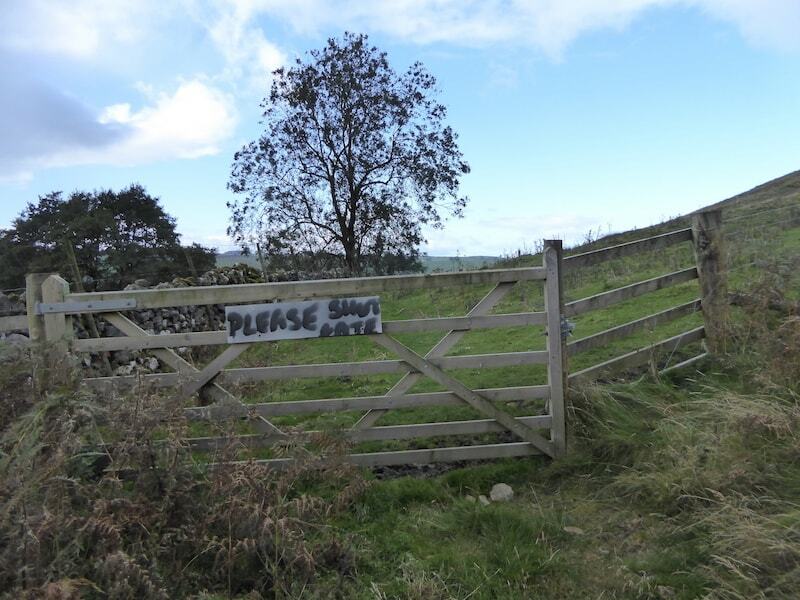 At the end of the bracken field it looks as though the same helpful farmer has provided another sign and once again we comply with the terse request. 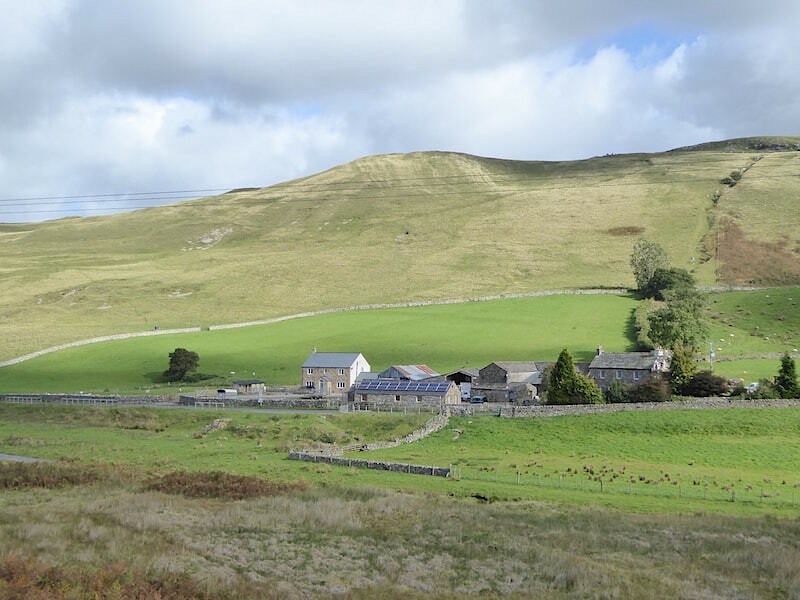 Out on the open fellside once again where the campers are still in residence over on the right. The large patch of cloud still hanging over us as we look back to Birkett Common. 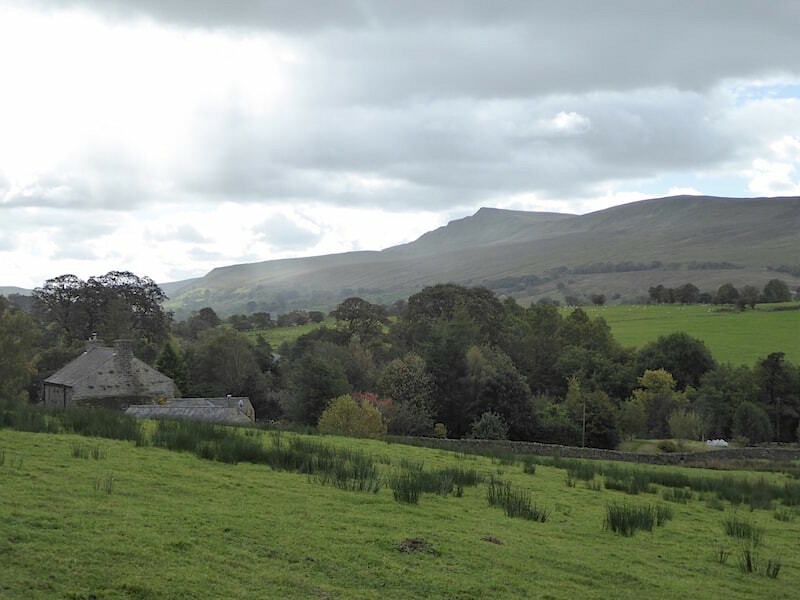 Wild Boar Fell to the left of it seems to be getting another of the rain showers. The view ahead as we cross the lower slopes of Great Bell. Finally the end of the cloud patch appears and …..
….. the sunshine returns, everything brightens up again and even the wind has died down. 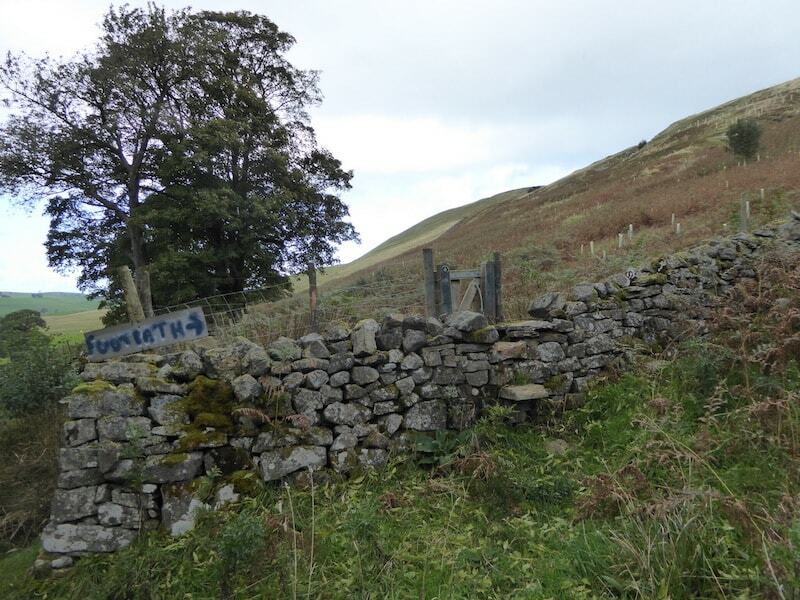 At the end of the wall on the left …..
….. we have to cross this gated stile onto the path which runs alongside Thringill Beck, although higher up the fellside it bears the name Kitchen Gill. 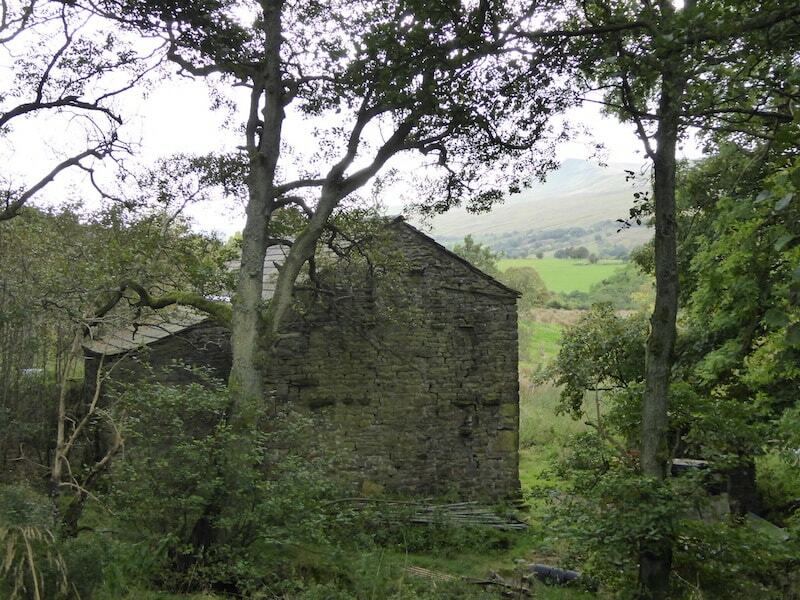 A look over to Ridding House which appeared to be uninhabited although the barns look in good condition so maybe they are still used. 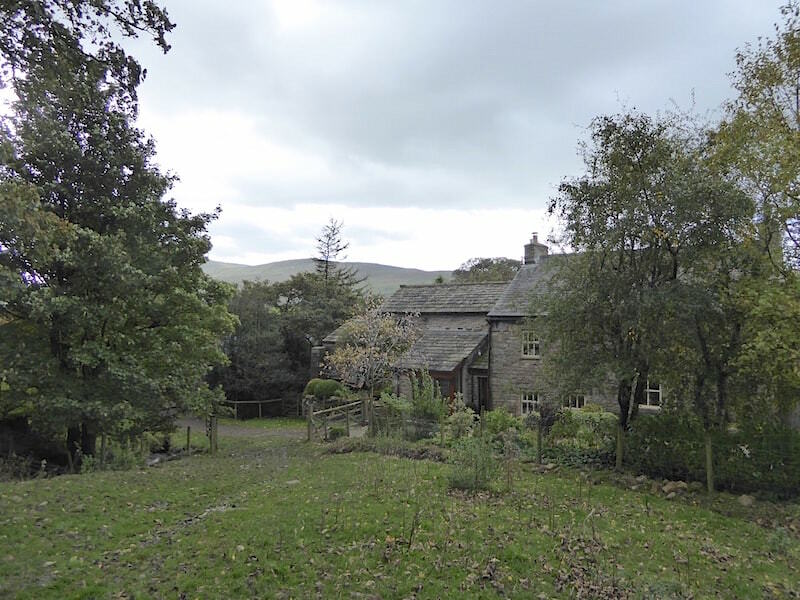 Ridding House seems to be the point at which, on the OS map at least, where the name of the beck changes from Kitchen Gill to Thringill Beck …..
….. but whichever name is used doesn’t alter the fact that it is as dry as the proverbial bone. 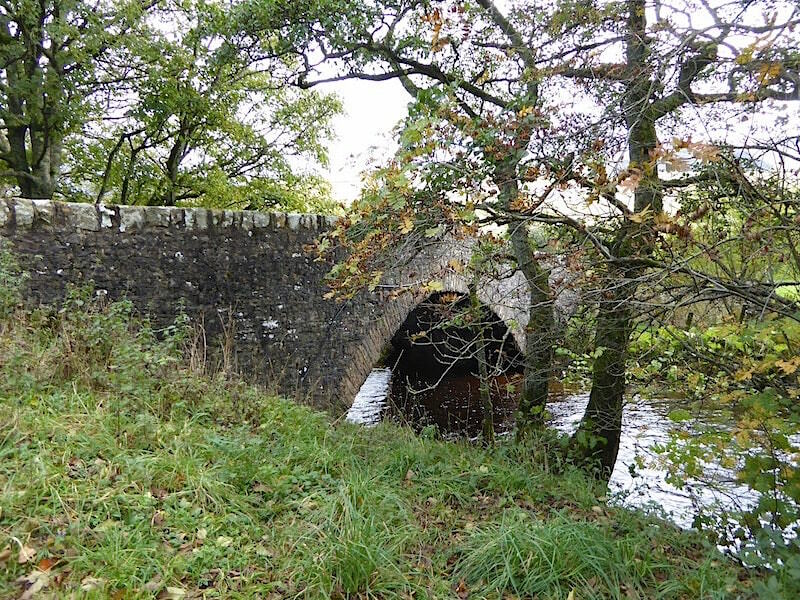 We used the bridge anyway as it was easier than scrambling down a beckside full of nettles, thistles and other scratchy stuff. 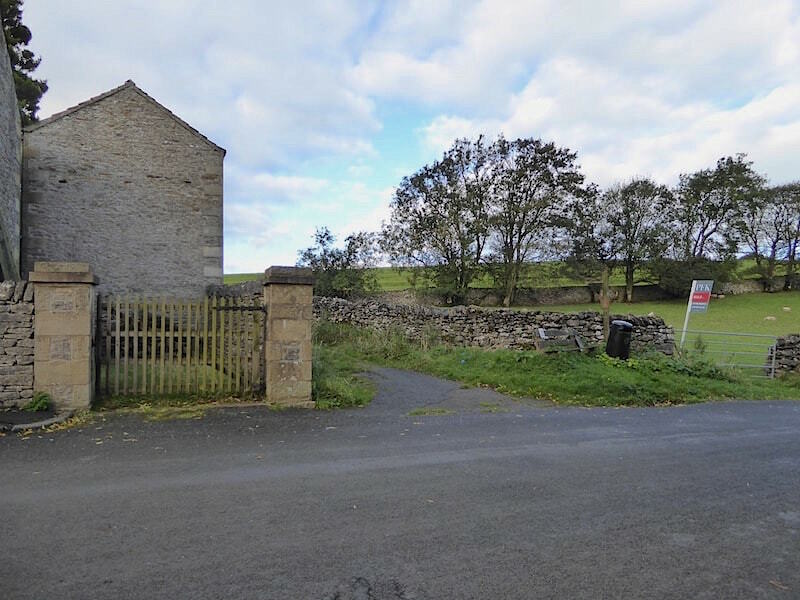 We pass around the back of Thringill Farm and beyond the gate we are back on the B6259 once again for another very short spell of road walking up to a lay-by where we leave the road to join a footpath back to Nateby. 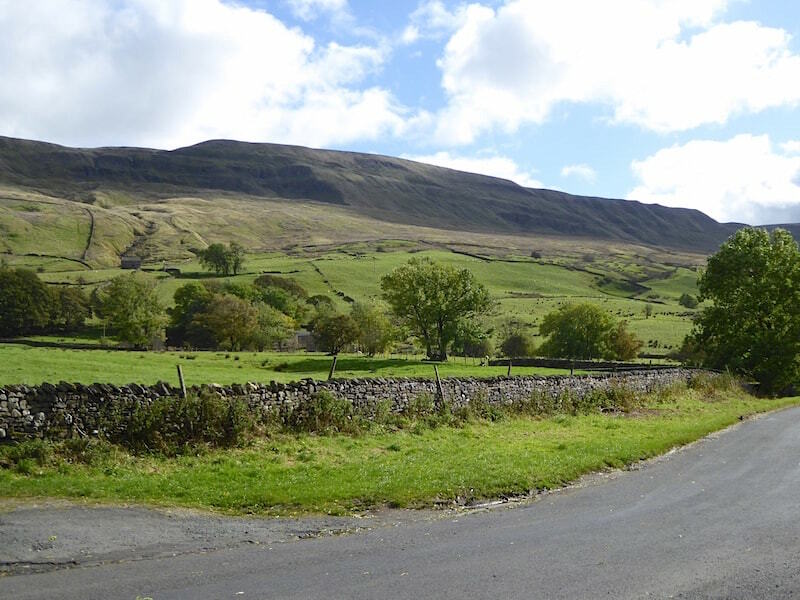 The RAF were out in force all today with all manner of aircraft thundering overhead and zooming along the Mallerstang valley at regular intervals. 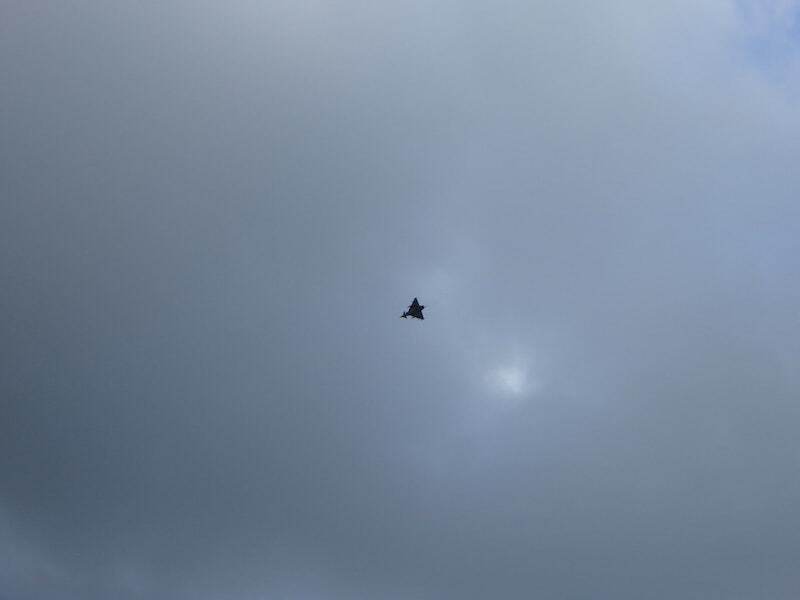 Apparently we saw trainer aircraft, Tornadoes and a couple of these, which were Eurofighters apparently. As I am about as much good at identifying aircraft as I am at identifying cars they could all have been flying hen coops for all I know, so I just have to take it on trust from him as knows! My knowledge of them is as follows – I don’t like being on one, they make a hell of a racket, they move people and stuff from one place to another and, now and again, they drop unpleasant exploding things on people. 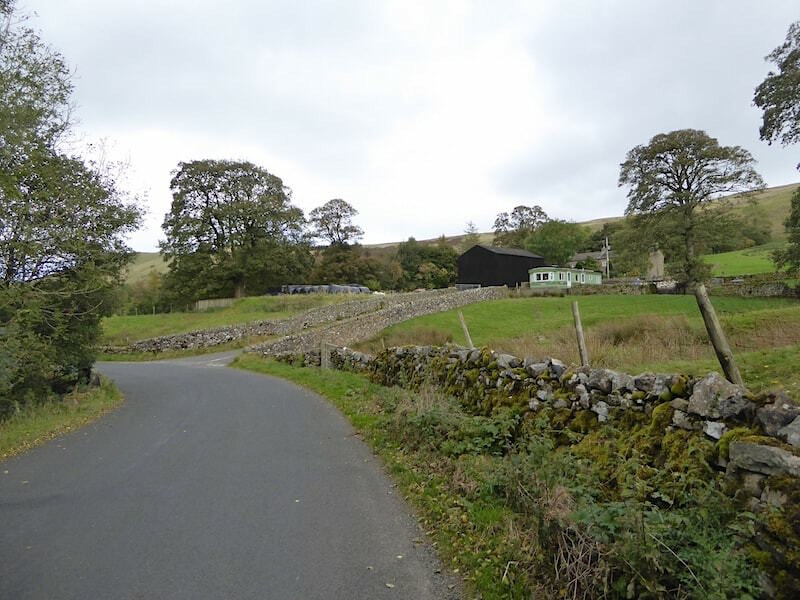 The aeroplanes disappear along Mallerstang and peace returns as we make our way along this old byway …..
….. down to the gate and back into Nateby. 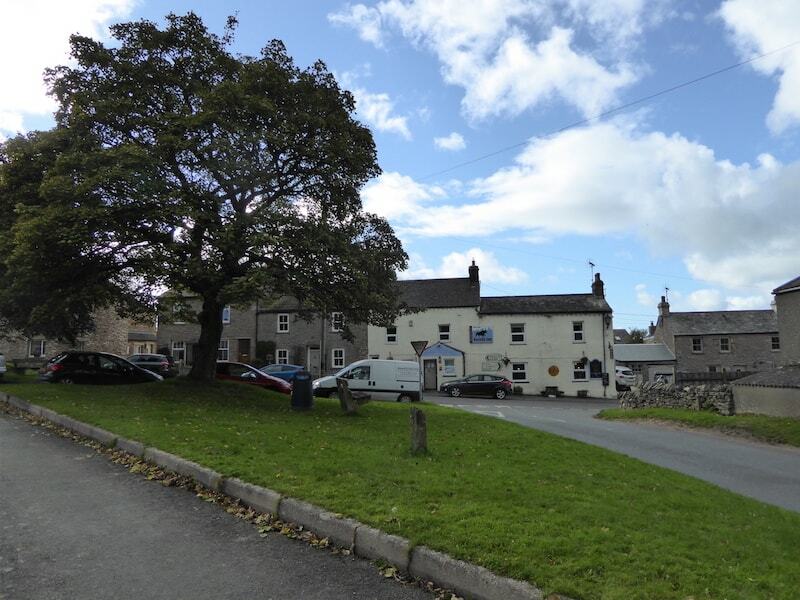 A look back as we pass through the gate and out onto the road …..
….. which takes us back to the village green and The Nateby Inn, which is the light coloured building directly opposite. Food is served every day from 12 noon to 8.30 pm, there are log fires during the winter, and no jukebox, video games or wide screen televisions to drive you to distraction, and its dog friendly if you have a dog. They also do accommodation, so all in all it sounds like a great little place. We didn’t call in today but I think we might be paying it a visit before much longer. So all we have to do now is walk over to the inn, turn right down the road and make the short walk back to the car. 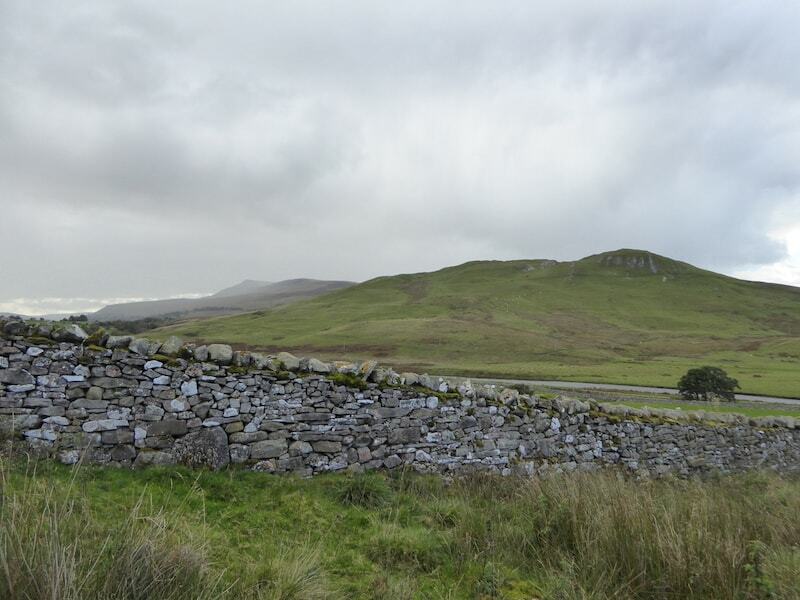 Apart from the sludgy mess on the open bridleway it was a much drier walk than the Wild Boar Fell one last week but even so, wearing the gaiters turned out to be a good decision. We could make a fair sized mud pie with the stuff which is clinging to them!